A lot of people are not aware that there is a Business Set Lunch available at the “Soy” @ G Hotel at RM30++ per pax. This restaurant is one section of the “Sesame+Soy”, a Pan Asian Chinese restaurant that offers a luxurious new dining experience for the most discerning food connoisseurs about town. 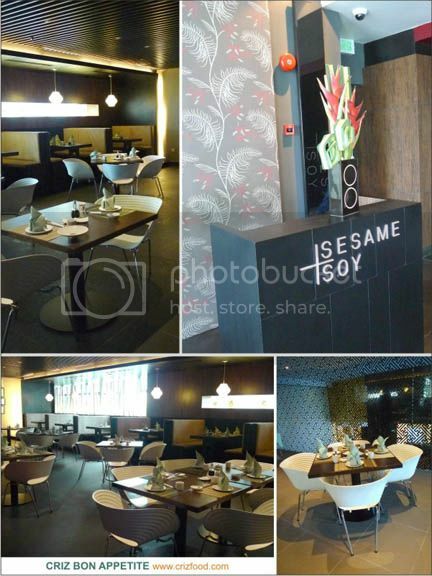 The “Sesame+Soy” restaurant’s uniqueness lie in its dual dining ambience in one space. “Sesame” is the epitome of fine dining while “Soy” is casual yet elegant. 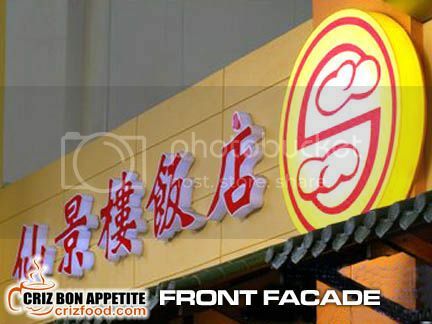 Both specialize in tantalizing fusion contemporary and classic Chinese cuisine. As for the Business Set Lunch, you would be served with Soup of the Day, either steamed rice or fried rice accompanied by any 2 items from the menu of 8 dishes and followed by Dessert of the Day, all within the cool and cozy ambiance of the restaurant. It would be great if you could have a company of 4 pax to share out all the dishes from the menu. The menu items would be changed every few weeks. To start the meal off, we were served the Soup of the Day which was the Radish Chicken Soup. It was just a simple home cooked soup with radish, carrot, wolfberries and chicken. Taste wise, it was just a normal soup with the natural sweetness from the vegetables. It somehow lacked the most important item to create that unique flavor which was the toasted baby cuttlefish. Moreover, it did not have that purity as in all clear soups. There were traces of blood remnants present, normally due to the meat (especially chicken), being dropped into water not at its boiling point. Let’s hope the kitchen would be more aware of this golden rule in cooking clear soup. 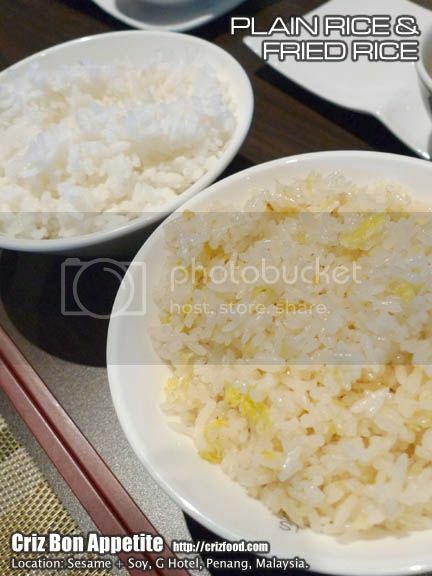 We had the option to choose either steamed rice or fried rice for the set meal. Since we had quite a number of people present, we chose both equally. The steamed rice consisted of rice from a good quality grain. So was the rice for the fried rice. Although the fried rice was just nice to go with the dishes, it would be great if it were to have some toasted garlic slices added in (just like those Japanese Teppanyaki style) to boast up the flavor. As we had more than 4 pax, it was just nice to try out all the dishes from the menu. The first dish was the Stewed Bean Curd. 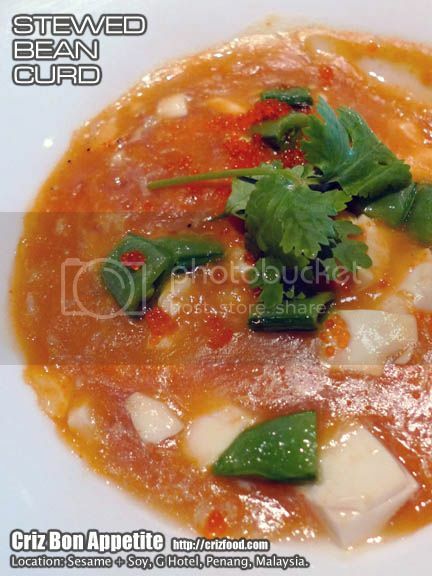 Instead of the normal style of cooking this dish with oyster sauce in starch, this tofu dish had that rich flavors from some seafood stock with traces of crab meat and crab roes. The chef was wise enough to add in some cut snap peas for the extra crunch rather than having those soft and thin snow peas. It was appetizing. 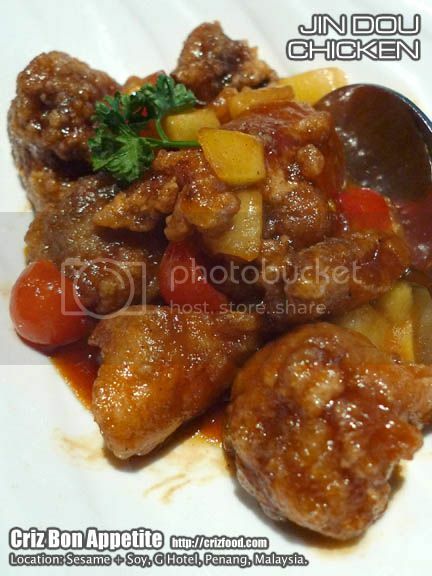 Next on the list was the Jin Dou Chicken with some honey dew cubes. The batter coated chicken pieces were stir fried in Jin Dou sauce. I could be wrong but the chicken tasted like it had been marinated in some fermented bean curd (nam joo) as the meat indeed had that distinctive flavor. The Jin Dou sauce was good as there were hints of LP sauce, black vinegar, plum sauce, tomato sauce, 5-spice powder and sugar being used here, together with some fruity flavors from the cubed honeydew. Overall, the dish was good but I would rather have the meat pieces to be boneless as well as from some drumsticks for a more juicy bite. We were also served the Steamed Snapper Fillet. 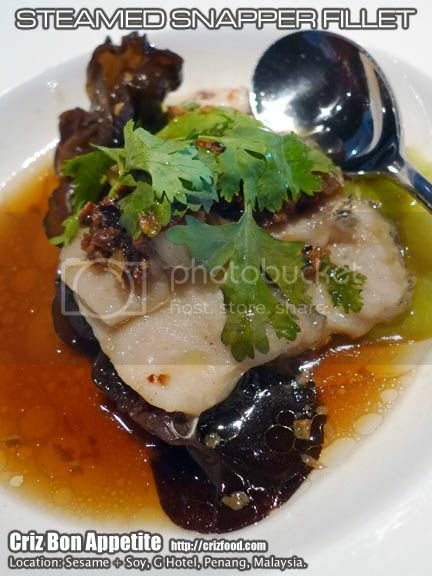 The snapper fillet was steamed on a bed of angled luffa (kak kua/丝瓜) and wood ear fungus (black fungus/黑木耳) in superior soy sauce and garnished with deep fried bean curd crumbs, sautéed garlic and coriander. It was a simple dish but the fish was indeed fresh. 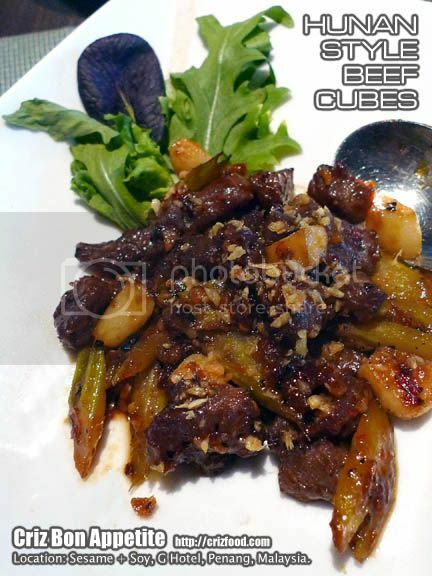 The next dish which was the Hunan Style Beef Cubes had us yearning for more. It was delicious with the flavorful beef cubes immediately melting in our mouth. 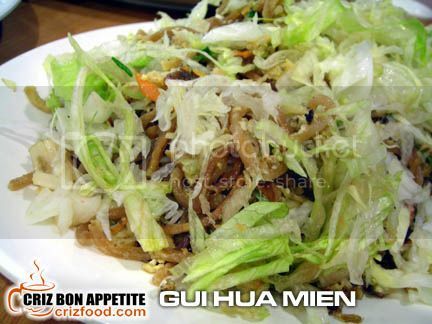 Hunan cuisine has always been very flavorful with the liberate usage of garlic, shallots and chili pepper. This dish had a little bit of twist with the usage of celery and some chopped dried shrimps on top of the usual usage of chili pepper, oyster sauce and black pepper corns. The meat was tender and juicy. It was super good! 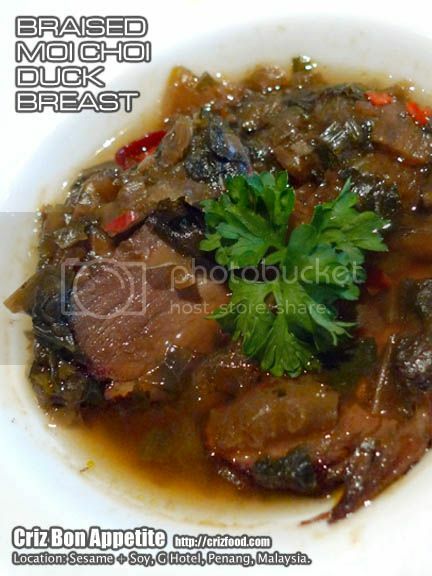 Braised Moi Choi Duck Breast was also presented to us. It was just a small amount on a huge plate. Somehow the taste of the whole dish was overpowered by the deep flavors from the duck meat. Moreover, the moi choi (pickled Chinese cabbage either salty or sweet) basically lost its taste by being soaked too long. The kitchen should take note that the unique taste from the pickled cabbage should not be lost totally when preparing such a dish no matter with what type of meat they would be using. 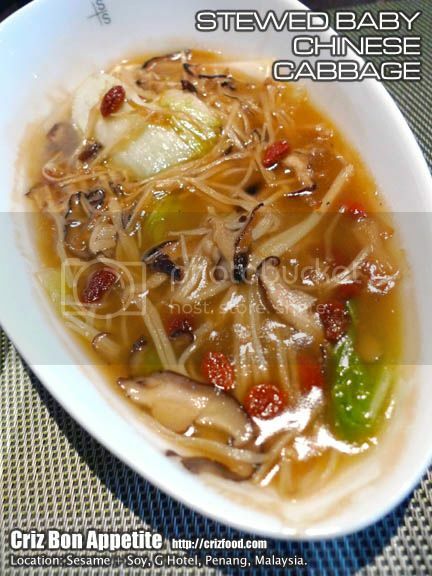 There was also the Stewed Baby Chinese Cabbage with enoki mushrooms, shitake mushroom slices and dry scallops garnished with some wolfberries. 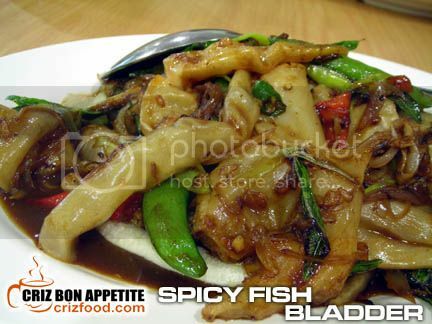 Although this dish was healthy with the mild taste from some oyster sauce in starch, it tasted rather bland to us. 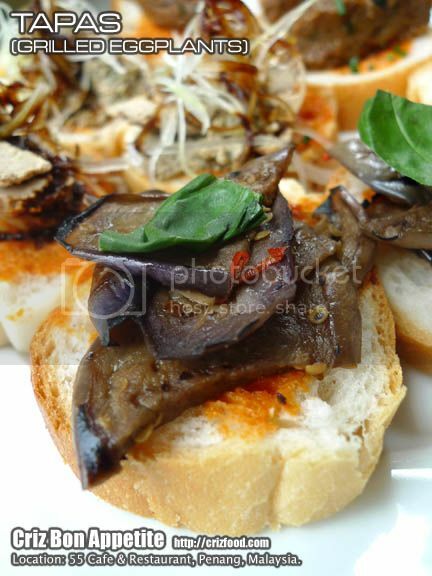 Alternatively, this dish should have the mushroom being marinated in some ginger juice, soy sauce, sesame oil and pepper and sautéed slightly to pep up some flavors. Moreover, the soaked dry scallops should be deep fried and served as garnish instead. They do serve another beef plus vegetable dish in the menu as well – Stir Fried Snake Beans with Beef Bisket Slices in Shrimp Paste. The dish was good with a notable taste from the wet shrimp paste (belacan) but it was a bit salty by itself. This dish would go well with steamed rice. The 8th and last dish in the menu was the Crispy Snapper Fillet. It had batter coated snapper stir fried with some red curry paste. It had a touch of Indian flavor and tasted more toward the tandoori style of preparation. Not a bad choice too. The Dessert of the Day was the Palm Sugar Brulee with Homemade Ice Cream. The whole concoction was marvelous. 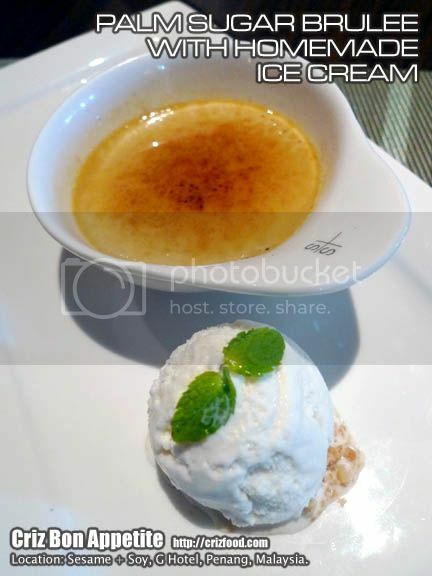 The natural sweetness from the palm sugar (Gula Melaka) blended in just nice with the crème brulee. It would be great if the brulee was torch burned a bit more for that burnt flavor. The hotel’s homemade ice cream was something not to miss out too. It was served on some sprinkles of crushed toasted peanuts and had that fineness and creaminess to my liking. 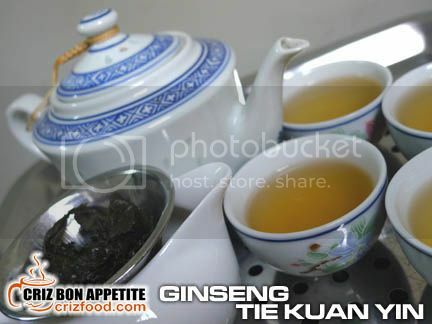 They also have a Taipei Specialty Cuisine Promotion for September/October 2011. We did try out a few main courses from the selection of 8 dishes. 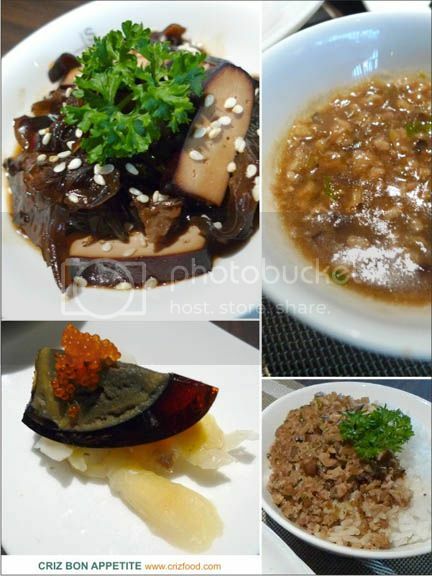 Each set of the selected main course would come with Chilled Braised Bean Curd, Century Egg with Pickled Ginger and Taiwanese Stewed Rice with Minced Pork & Mushroom. The first main course consisted of Stewed Chicken with Basil Leaves & Taiwanese Chinese Wine (RM26++). This dish tasted quite similar to the Cantonese style of Gu Lou Yoke (Sweet & Sour Pork) with the freshness of some tomatoes but with a stronger taste from the added basil leaves. This dish would taste better if boneless chicken especially from those drumstick and thigh parts were used for a smoother bite. 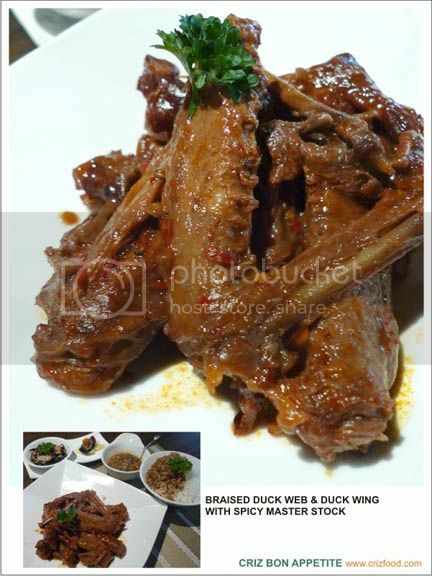 The next main course was the Braised Duck Web & Duck Wing with Spicy Master Stock (RM24++). This dish would suit people with acquired taste with the strong spicy taste from the duck as well as the flavors from the master stock. 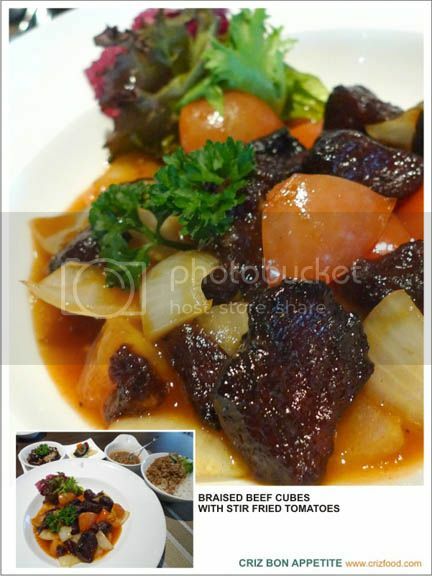 The last of our choices was the Braised Beef Cubes with Stir Fried Tomatoes (RM42++). No wonder the price was the most expensive on the menu. This was a superb dish just like the Hunan Style Beef Cubes. The chef did a great job here in serving another tender yet flavorful palate here. The Soy Restaurant is located at the first floor of G Hotel. If you walk in through the front entrance along Persiaran Gurney, just head for the stairways on your left, just right before the reception. Walk up and you will see the restaurant entrance. Many of you would be wondering who would be replacing the former Kopi Cine outlet along Lorong Stewart within the heritage area of George Town, Penang. You don’t have to guess any longer as the premises together with the other 4 lots along the row would now house Coffee Atelier, which consists of 55 Café & Restaurant (Mediterranean), Kopi (Coffee Museum), Gehrig Art Gallery, 47&49 Residence (Suites 47A&B, Suites 49A&B). The whole place would be manned by yet another foreign couple, Swiss Stefan Gehrig and his lovely wife from Hong Kong, Lorina Gehrig. While waiting for the renovation works for the rest of the lots to be completed, 55 Café & Restaurant had a soft launching yesterday, serving delicious Mediterranean dishes and aromatic coffee, the best of its kind in Penang. Even the aroma emitted from the fine graded coffees could not stop an American traveler from New Orleans, Louisiana, USA, from stopping by for a sip of the beautifully brewed coffee. Since we were quite late for breakfast due to the heavy rain yesterday, we had a try out on the lunch items instead. There were a few selections in menu, starting with choices for breakfast, salads, starters, hot & cold tapas, pasta, desserts and beverages. We started with some tapas of hot and cold, all served with a plate/bowl of your selected item and a basket of baguette slices. 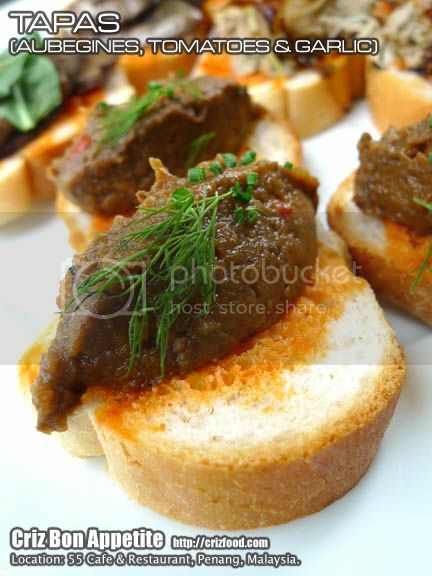 The first one was with Chicken Liver Pate (RM14+). The pate was well prepared with traces of fresh herbs, butter, shallots, garlic, salt and pepper to cover up the bitterness from the chicken liver. It would even be better if they could just add in some dashes of brandy for that extra flavor. The next batch was with Aubergines (eggplant), Tomato and Garlic (RM9+) in a paste form. 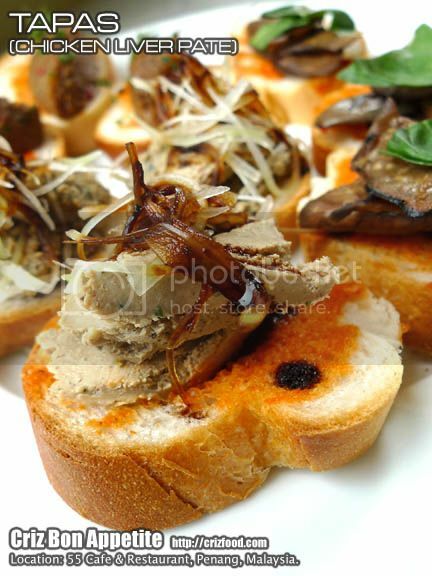 It had some traces of black pepper being added in and was quite spicy but it complemented well with the baguette slices. We also had with some tapas with Grilled Eggplant (RM9+), garnished with some sweet basil and chili slices for that light touch of spiciness. The next set of tapas was the Gambas Aljillo (RM13+) served with some baguette slices. 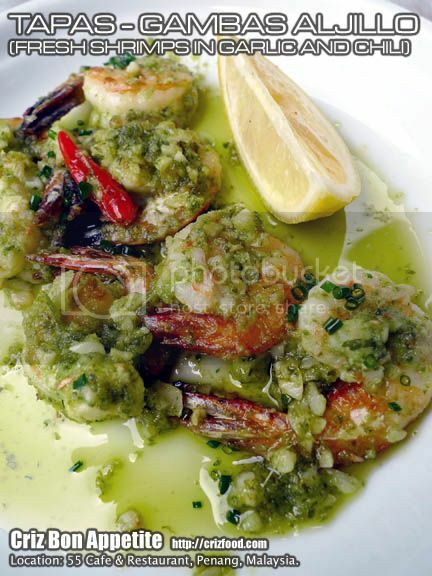 It was a hit amongst us as the fresh and firm prawns were beautifully cooked with chopped garlic, chili and some herbs in extra virgin olive oil. The dish was so lovely that we wiped out the whole plate dry with the baguettes served. After the light finger food to boost up our appetite, we went for the Al Chef (RM28+). 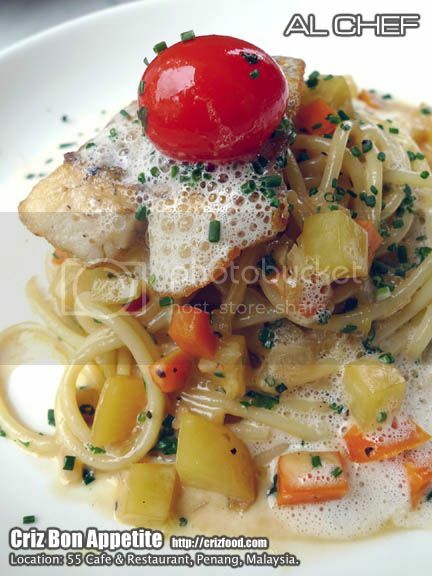 The dish had pan-fried sea bass fillet, served on spaghetti stir fried with potatoes and carrot casserole and seafood emulsion, garnished with a cherry tomato and some chopped chives. The sauce was awesome as it had some distinctive flavors from some toasted prawn shell, almost similar to the flavors of the lobster bisque I had at QEII. I won’t mind having some dashes of white wine in the sauce to go with the nicely pan-fried sea bass fillet. 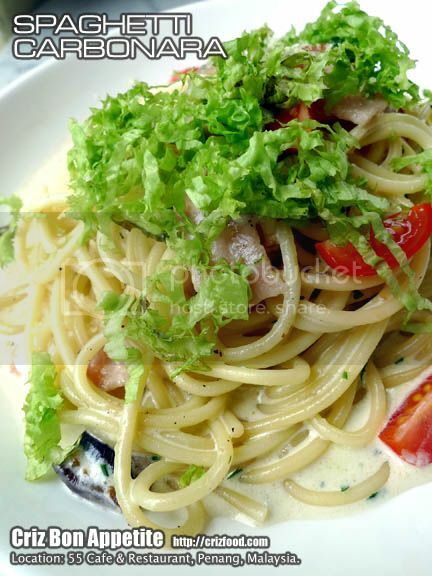 We also had some Spaghetti Carbonara (RM22+). The al dente pasta had a generous amount of back bacon slices, mushroom slices, egg, parmesan cheese, black pepper, hint of extra virgin olive oil and some fresh herbs cooked in white cream sauce, garnished with some chopped chives, tomato cuts and some lettuce slices. Although the whole combination was flavorful, the meaty back bacon with less fat somehow did not provide that nice fragrant bacon taste for the dish. Moreover the bacon tasted more cooked in sauce rather than being sautéed slightly prior to cooking. Ideally, but not totally healthy for those health conscious diners, sautéed slab bacon or streaky bacon would have a better justice to the overall taste of the pasta. 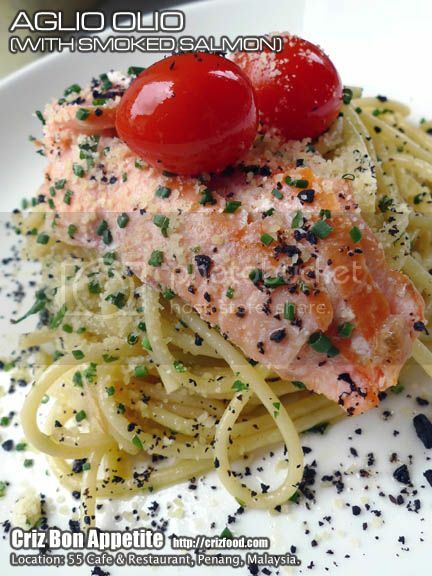 The Aglio Olio with Smoked Salmon (RM25+) in extra virgin olive oil was somewhat different to the ones I had tried elsewhere. It did not have some deep fried dried chilies added in for that nice pungent flavor. 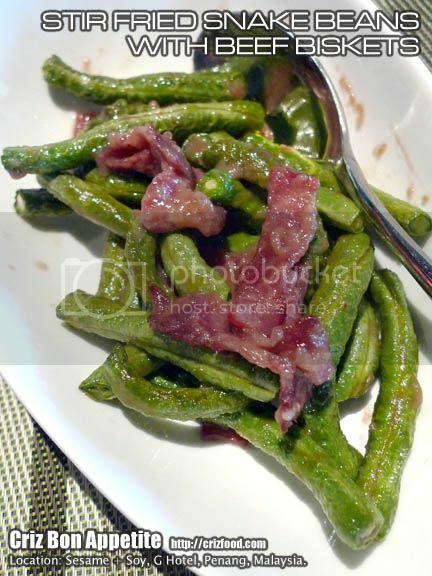 Moreover, it lacked the taste from some sautéed garlic slices which played an important part in this dish. Although some crispy chopped garlic were added in as garnishing, those were not adequate enough to pep up the overall taste. The pasta was presented with two cherry tomatoes, garnished with some chopped chives and grated parmesan cheese. The dish had the required amount of extra virgin oil added in but with overused of grated parmesan cheese. It was slightly on the salty side as the chef might have forgotten that the smoked salmon might have been treated with some salt during the preparation process. They do have some different type of desserts served daily. So you might need to enquire about them from the counter. We tried out the Baked Cheese Cake (RM9+). It was not as what we expected as the cake was rather dry without much traces of the cheesy taste. Moreover, the slight sour after taste was rather mild instead of the usual lemon zesty flavor. The Chocolate Coffee Cake (RM6+) tasted better, considering that it was fluffy, moist with some traces of some chopped almond but it lacked a stronger taste of coffee. Moreover, the chocolate coating was rather sauced based. A bar of wrapped cheesecake by Gateau which had not been officially sold was passed around for our comments. This version indeed had our praises as the usage of cheese on the digestive biscuit base was of standard. I guessed the café should take note on the quality of cakes supplied to them in the near future. As for beverages, there was a wide selection to choose from ranging from coffee, chocolate, tea, ice cream milkshakes, mocktails to beers. We tried out the Caramel Hot Chocolate (RM10+). It was frosty and nice. The Chamomile Dream (RM9+), a fragrant and flavorful flower tea served in a pot was as fine as it should be. This flower tea has always been my favorite tea due to the fact that it’s a cure all tea for building up the body immune system against cold related infections, relaxing the nerves, strengthen the liver function, relieving back pain, rheumatism, etc. There was also the Vanilla Ice Cream, Banana and Chocolate Chips Milkshake (RM16+). It had just the right flavors but was not as creamy as the one I had at Delicious, Straits Quay, Penang. 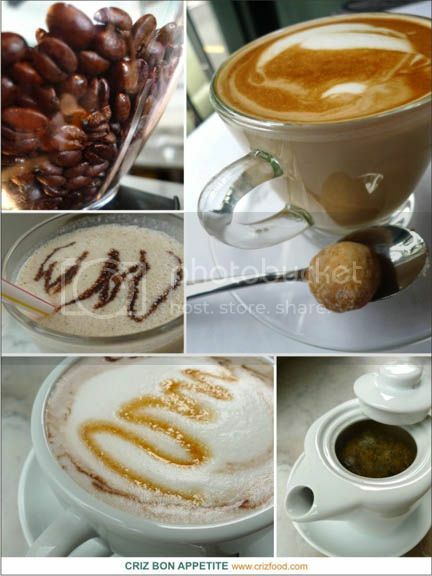 When it comes to coffee, the café sure can declare they are the best with their state-of-the-art coffee maker. The Hot Latte (RM8+) I had was the best I had taken so far with the right thickness, sweetness and creaminess it should have. Simply awesome! Here’s a sneak preview of the almost completed hotel interior. The charges would be between RM300 and RM400, with or without breakfast. The rates would be confirmed very soon by the management upon completion of the heritage hotel. Overall, the food served here can be quite unique on its own. All the dishes served here are of fresh ingredients and can be well accepted by the locals as well as foreigners but there are still rooms for improvements for some of the dishes as I had mentioned above. The prices for food can be a bit high for some dishes and beverages. Please also note that there would be a 10% service charge applicable for all purchases. 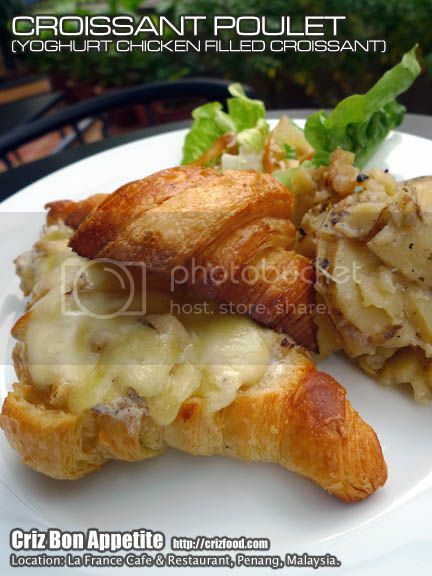 If you are a frequent diner at the Northern Beach Café situated along Jalan Sultan Ahmad Shah in Penang, you would notice that there was this little stall selling great French food by the name of La France. Well, that was history! Today, that former little stall by the beach cafe, manned by the loving couple, Frenchman Nathan (who lives near to the border of Germany) and his lovely wife, Ginny, has moved into a cozy mansion of their own, right in the heart of the beautiful George Town, Penang. The all new La France Café & Restaurant now promises a more unique and fresh home cooked French cuisine with a little touch of German. Merveilleux! Wonderful! There are two type of menus available here, namely the Menu Dejeuner (lunch from 12.00 noon onwards) and Menu Diner (dinner from 6.00pm onwards). The latter has a few additional items added in for a more fulfilling dinner. Let’s start with the entrees (starter). One of the dishes which I tried out was the Potage du Jour (Soup of the Day – RM5.90) which happened to be Mushroom Soup. It would be served fresh from the kitchen with some sprinkles of black pepper. The soup had a distinctive earthly taste from the finely chopped Shitake mushroom within (most restaurant would just blend all in). It had this sweet but not too creamy taste which was quite different from elsewhere. 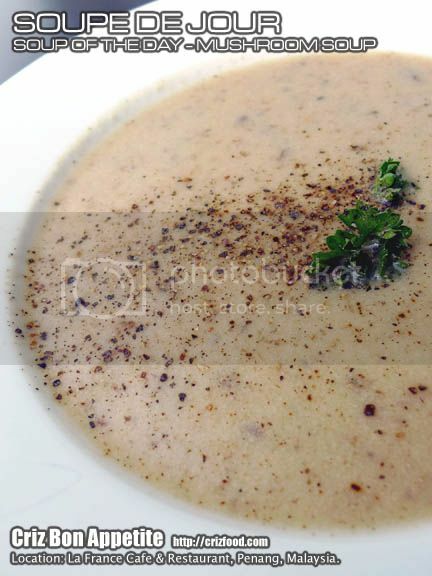 Instead of the normal usage of flour to create that broth like soup version, the chef applied a healthier method by substituting flour with some freshly mashed potatoes and a mild touch of chopped parsley. Simply healthy and delicious! The soup would not come with any bread or bun, so you might want to order some Pain d’ail (garlic bread – RM3 for 5pcs ciabatta slices). 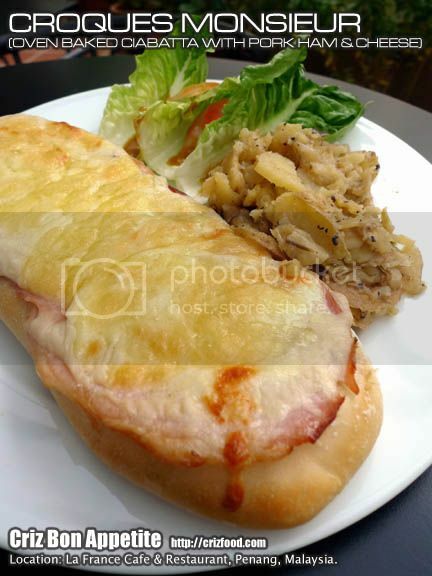 There was also the Croques Monsieur (Oven baked Ciabatta) – Croc’ Ham & Cheese (Pork Ham – RM9.80) served with some sautéed potatoes and fresh greens. The whole dish was heaven! The half-sliced ciabatta had just the right crisp on the surface while maintaining the softness within. The bread has some light spread of butter, chopped parsley, pork ham and cheese, prior to being oven baked to perfection. The taste of the cheese was rather different as Mozarella cheese alone would not have that sharp salty cheesy taste. Some crumbles of bleu cheese were used too. The other two side dishes needed some compliments as well. The sautéed potatoes were awesome with a nice aromatic taste from some added herbs. The fresh greens may look normal but when you mix them together with the special dressing created by the chef, it was totally another response. The slightly mustard spiced dressing with some butter-flour roux béchamel sauce and herbs was superb for any salad. As for pasta, they would use the twirl like fusilli pasta. I tried out the Aglio Olio with Extra Virgin Olive Oil (RM9.00). This version was totally different compared to others. I guessed different restaurant prepared this dish differently. Basically, Aglio e Olio means garlic and oil. 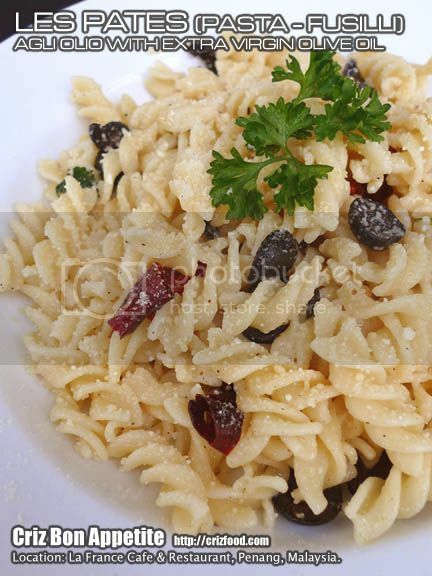 The pasta came with some cut dried chili pepper, cut black olives, chopped parsley, sliced garlic, some sprinkles of black pepper, mixed with some extra virgin olive oil and garnished with some parmesan cheese. Overall, it may look rather dry for some but each mouthful gave a totally different cheesy experience. Finally, the whole dish was cleared. Personally, I felt that it may need just a bit more dashes of olive oil, a more fragrant sautéed garlic slices and some available chili flakes for those who love the dish to be a bit more spicy. There was also the Crepes de Bleu (Savory French pancakes) section to try out in the menu but I opted for other dishes as it basically consisted of fillings such as eggs, chicken, tuna and smoked salmon but there was this dish that caught my attention. It was the Oven Baked Crepes Beef Bolognese (RM13.90) with cheesy toppings. Well, I had too much of meat and cheese for a day, so I leave it for another day. Instead, I headed for the Dessert Maison section. I had the Crepes Suzette (RM5.90). It was a hot and cold dessert with two folded hot crepes, topped with slightly sweetened fresh orange juice and served with a scoop of vanilla ice cream. 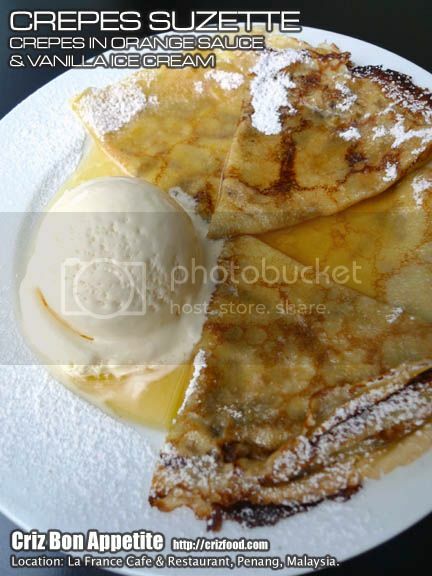 The tangy taste of the juice on the crepes combined with the creaminess from the ice cream was simply refreshing. The next dessert which was the Crepe Compote (Apple & Banana – RM6.80) was another great dessert. 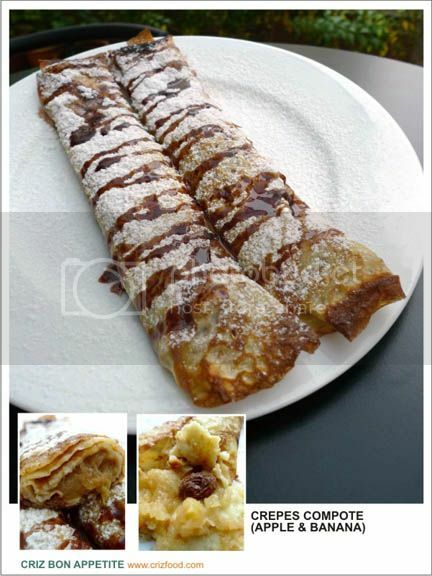 The crepes were rolled up with some fruit compote, sprinkled with some icing sugar and garnished with some hot chocolate sauce. This was another superb dessert for all. The natural sweetened compote had a bit of wine after taste due to the cooking reaction by the combination of the two fruits. It had some raisins and a bit of grounded cinnamon added in for that flavorful taste. As I had mentioned earlier, the menu had some additional dishes added in. Let me share with you what you would expect from here. There’s the Omelettes Soufflees (Fluffy) with choices such as the Omelette Champignon (Fresh Mushroom – RM9.90) Omelette Fromage (Cheese – RM9.50), Omelette Jambon Fromage (Ham & Cheese – RM10.50) and Omelette Forestiere (Mushroom, Ham & Cheese – RM12.90). 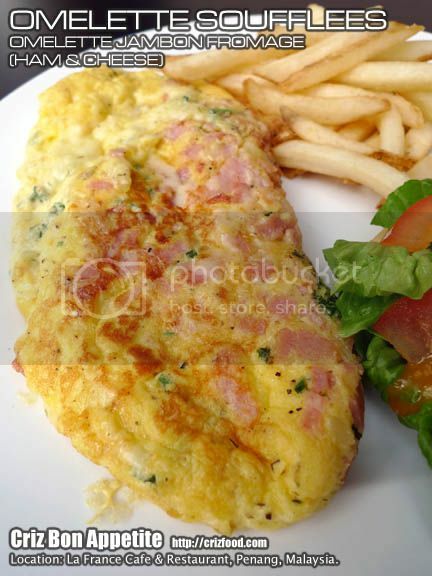 I had decided to go for the Omelette Jambon Fromage (Ham & Cheese – RM10.50) which had chopped hams, onions, chopped parsley, black pepper and cheese. It was cheesy and flavorful. The dish also came with some Pomme Frite (French Fries) and greens. This was another marvelous dish by the restaurant. There are two additional dishes for dinner in the Les Regionales (French Local Specialties) section. Other than the Quiche Alsacienne with Bacon & Cheese (RM9.50) and Bratwurst with Sauteed Potatoes (RM11.80) available for both meals, I tried out the Kartoffelpuffer (Alsacien Potato Pancakes – RM10.90). 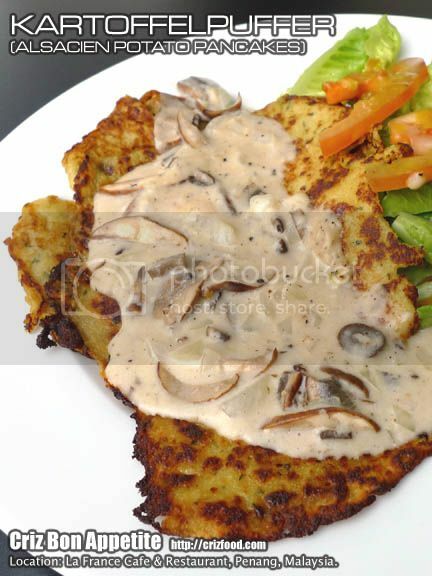 It was a thin fried savory pancake originated from Europe which consisted of grated potatoes, flour, eggs, onions, chopped parsley, topped with sautéed mushrooms in bechamel sauce and served with greens. It tasted quite normal to me as it was but when combined with the sauce, the creaminess and buttery taste of the evenly coated pancake was awesome. The slightly burned edges of the potato pancake gave it that extra flavor. The dish also came with some fresh greens. 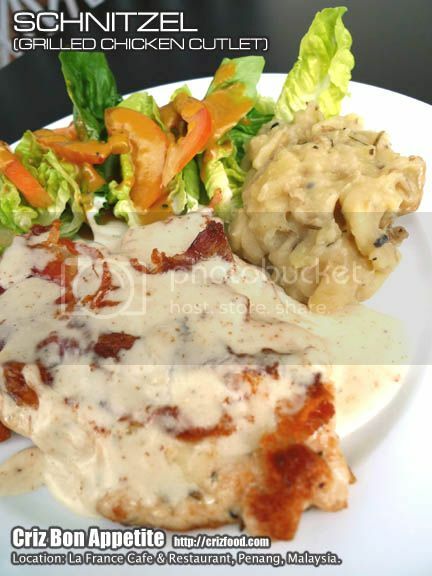 Another of the dinner dish would be the Schnitzel (Grilled Chicken Cutlet – RM14.90). The grilled chicken with a flavorful layer of pork ham and served with white sauce was very tasty. It had some nice crisps at the edges while keeping the moist with the tender meat. This came with some sauteed potatoes and greens. 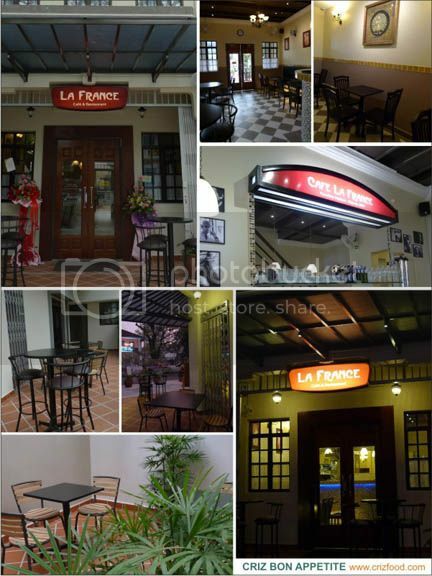 La France Café & Restaurant is not just a place for your meals but also a great place for meet ups. 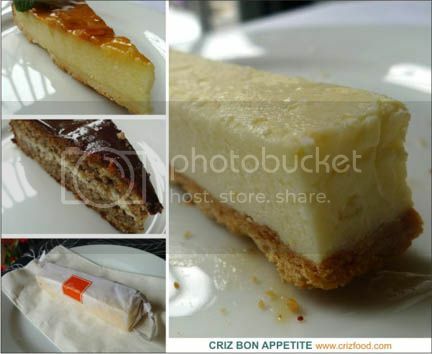 You can have some nice desserts during tea time or supper over some hot and cold beverages. 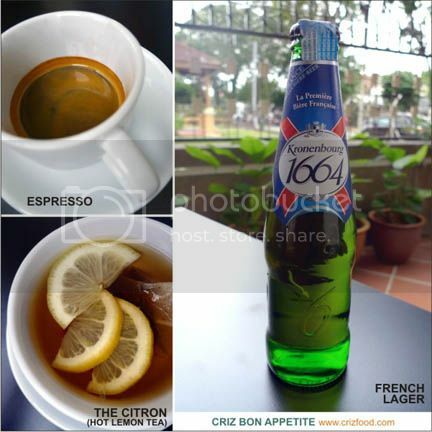 On top of that, they do serve imported lager such as the Kronenbourg 1664 (RM16.90), which was reported symbolized the French art of pleasure, exquisite in every details and universally desirable. Overall, the dishes served here are delicious, provided you are a lover of cheese and healthy food, as all the food served here are made fresh from selected quality ingredient and does not contain any monosodium glutamate (MSG). The portion may look rather fine and small in some dishes but it’s the standard size as served in France. It would be more than enough to fill up your appetite… unless you are an extremely big eater. Some of the cheese based dishes may contain some crumbles of blue (bleu) cheese which would give the dish a unique, sharp and a bit salty flavor. All dishes are fairly charged with a nett price tag. La France Cafe & Restaurant would not be visible by the main road. If you are from town towards Pulau Tikus along Jalan Burma, keep to your right after passing the Giant Supermarket (Penang Plaza) at the junction of Jalan Burma/Jalan Larut. Keep driving until you have passed Him Heang, a church, Jemputee (junction of Jalan Burma/Jalan Chow Thye), a vegetarian food court and Malaysian Chin Woo Association on your right. Turn right into Jalan Servis (between Chin Woo Association and Malaysian Buddhists’ Association) and drive all the way in until your see a right junction (Jalan Irrawadi). At the corner lot, you would see the El Case Wine & Dine Restaurant. 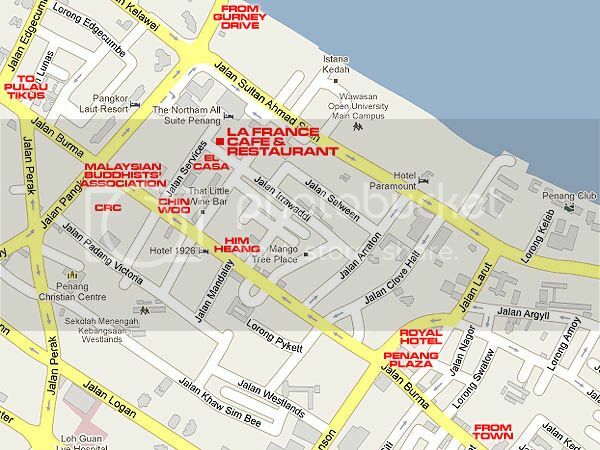 La France Café & Restaurant is just opposite the café in a state-of-the art mansion. You won’t miss it at all. 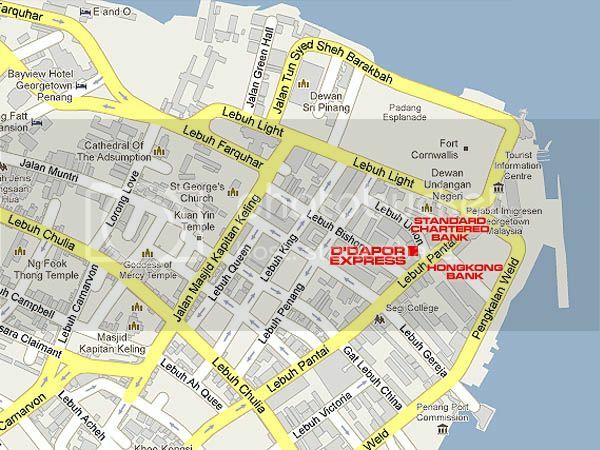 Address: 3B, Jalan Irrawaddi, 10050 Penang, Malaysia. Over the past few months, Pulau Tikus in Penang has become a little Thai cuisine paradise for Thai food lovers. With different style of cooking and flavors from 6 regions with 76 provinces (excluding Bangkok which is the capital city) in Thailand, Penangites now have more options to try out these restaurants. 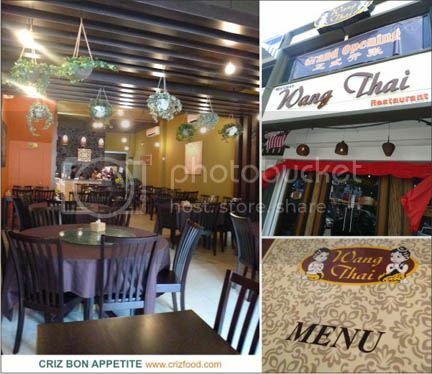 We now have some home cooked dishes from the province of Nakhon Si Thammarat in Southern Thailand at Annathai-Kitchen, beef noodles from Sukhothai in Central Thailand at Sukhothai Beef Noodles House, Krung Thep Maha Nakhon (Bangkok) style Thai dishes at Aroi Thai Restaurant and at the newest outlet in Penang – Wang Thai Restaurant. 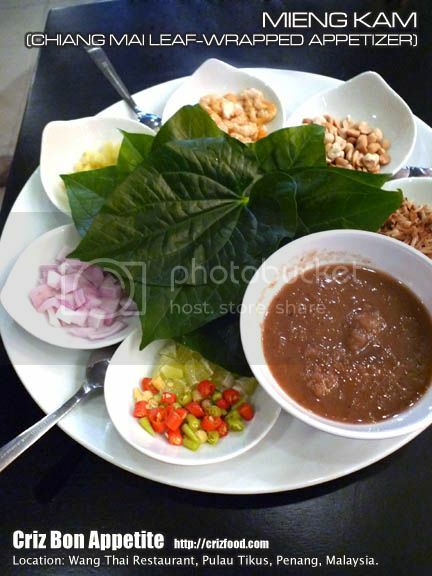 It’s quite normal for diners to start off a meal with Mieng Kam (Chiang Mai Leaf-Wrapped Appetizer – RM15), an appetizer originated from the Northern provinces of Thailand. The palate of appetizer would come with wild betel leaves (daun kaduk) to wrap in some dried shrimps (hae bee/har mai), peanuts, cubed galangal, shallots, kaffir lime, chili paddy (bird’s eye chili), toasted grated coconut and topped with some sweet plus salty based sauce. Now you know why this dish is also known as “One Mouthful” as your handy work would be put right into your mouth for that flavorful chewing. One distinctive difference compared to major Thai restaurants elsewhere would be the sauce served here. Instead of the normal caramel looking sauce, which basically consisted of melted palm sugar, fish sauce and water, this version had grated coconut and chopped dried shrimps added in. It’s a superb dish to start a meal. 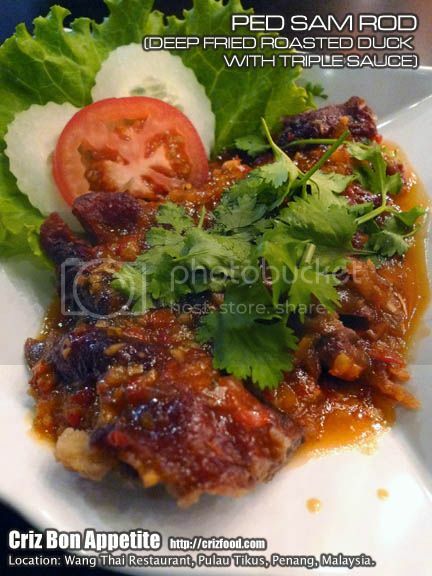 Another great dish would be their Yum Pla Duk Fu (Deep Fried Catfish in Spicy & Sour Mango Salad – RM12.90). 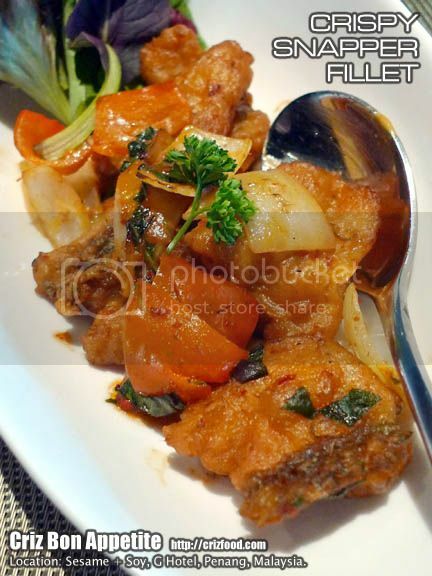 This dish had deep fried flour coated steamed catfish flakes, topped with a combination of raw mango strips, sliced onions, carrot strips, chili paddy, dressed with some sweet spicy sauce and garnished with some roasted peanuts. This is a must try dish! Just as good as the one I tried at the outskirt of Hatyai, Thailand some years back. Note: Do consume this salad fast in order to have that crispiness from the deep fried catfish. 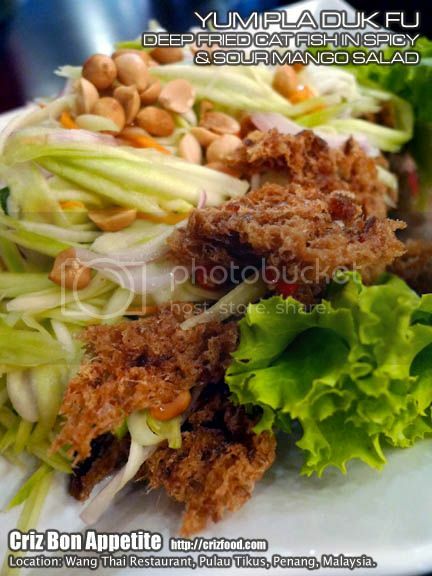 An alternative salad would be Yum Cha-Om Tod Krob (Crispy Cha-Om with Thai Sauce – RM12.90). This is another great dish to compliment. Cha-Om (climbing wattle/Acacia pennata) is actually the young leaves from a tropical “coconut leaves lookalike” shrub which had became a staple food in Thai cuisine. 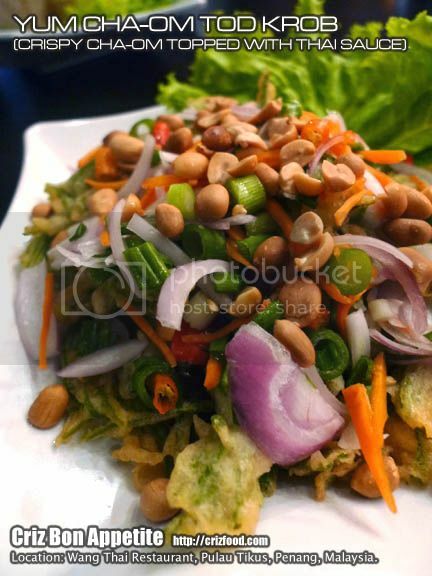 These leafy vegetables would be deep fried in batter and laced on the plate, prior to being topped with a sliced onions, carrots, spring onions, chili paddy, dressed with some sweet and sour Thai sauce and garnished with some roasted peanuts. This is a must try dish! 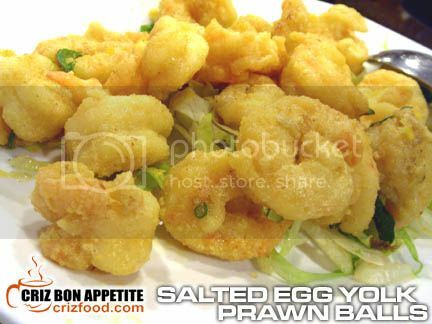 Note: Do consume this salad fast in order to have that crispiness from the batter fried vegetables. If you want to try out the World’s #1 Most Delicious Food – Massaman Curry from Thailand based on the recent CNN Go results, this delicious dish is also available here. 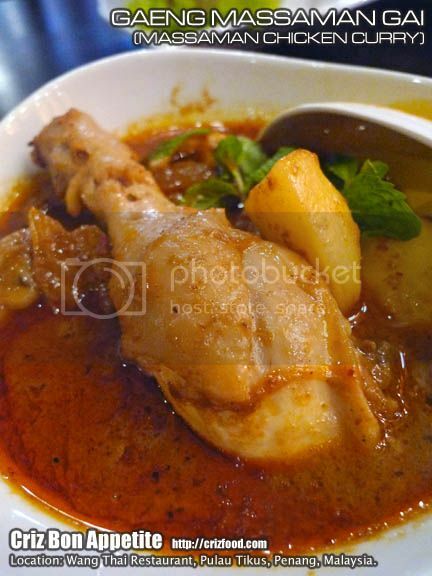 The Gaeng Massaman Gai (two drumsticks – RM12.90) actually had a bit of Indian Muslim influence as some of the ingredients used are quite similar. The gravy looked somewhat like the Nyonya Kapitan Curry without the use of kaffir lime leave and lime juice. Instead, the dish has a more Indian flavor with a distinctive flavor from some blended galangal, palm sugar, cardamom and cassia leaves (Indian bay leaves). This dish had added potatoes and roasted peanuts. Although the taste was still acceptable to many, I personally found that it had a little bitter after taste. It could be due to too high a fire when the chef sautéed the blended curry paste. Moreover, there was this rough ingredient which I had suspected to be some toasted grated coconut being added in. The preparation for this dish is somewhat different here. 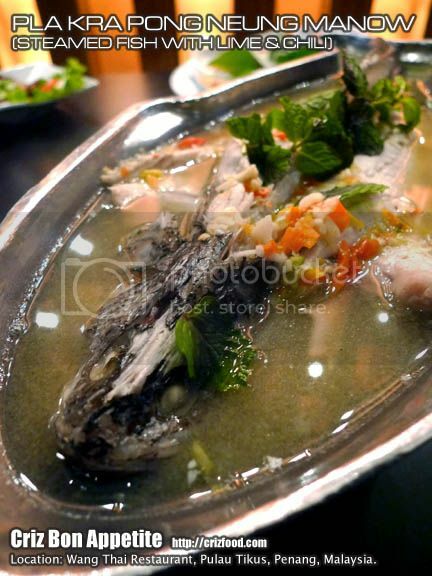 You should never go without a Thai style steamed fish whenever you visit a Thai restaurant. We had a different version called Pla Kra Pong Neung Manow (Steamed Fish in Lime & Chili Marinade – RM35 for small fish). This signature dish has concocted flavors from some lime juice, ginger, galangal, lemongrass, garlic, chili paddy, chilies and sugar. Although this dish was rather appetizing, I personally prefer the normal salty steamed ones with just sour plums, tomatoes and tofu as most of the dishes were already having too much of spiciness, sourness and sweetness. We had sea bass here. Another dish that was presented differently was the Hor Mok Talay (Steamed Seafood Otak-Otak – RM23.90) served in a fresh coconut. The dish was a wetter version of the Nyonya Fish Otak-otak without the usage of wild betel leaves (daun kaduk) and sliced kaffir lime leaves. I had a feeling the ingredients within the coconut were stir fried rather than steamed as mentioned earlier. It had a heavy usage of Thai basil leaves combined with blended spices, sliced cabbages, onions, fresh coconut milk, prawns, squids and fish with a touch of beaten eggs. The dish was garnished with fresh coconut flesh. Overall, the dish was still acceptable by many. I was surprised that they do serve Ped Sam Rod (Deep Fried Roasted Duck with Triple Sauce – RM18.90) as well, which you don’t usually get this dish from elsewhere. The duck meat was rather tender and flavorful. There were strong hints of garlic, tomatoes, chilies and plum sauce being used in the dish. Never leave a Thai restaurant without trying out their Tom Yam soup. 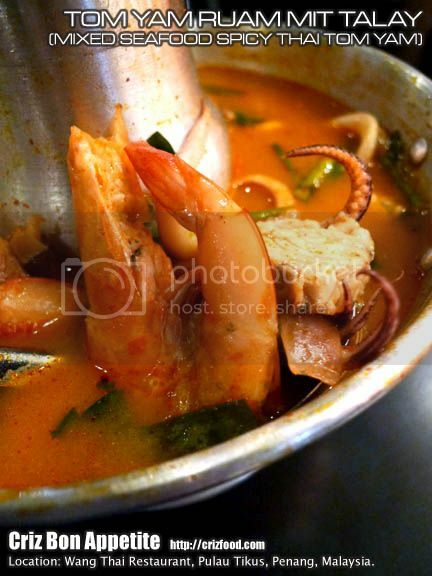 What we had was the Tom Yam Ruam Mit Talay (Mixed Seafood Spicy Thai Tom Yam – RM21.90). The soup had large prawns, fish, squids, oyster mushroom, tomatoes with some chopped spring onions and coriander. Well, the soup tasted like those easily available tom yam paste with a strong sweetness and lime juice sourness. I prefer Tom Kha, a clearer soup based and not so spicy version. There was a bit of evaporated milk added in this soup for that extra creaminess. 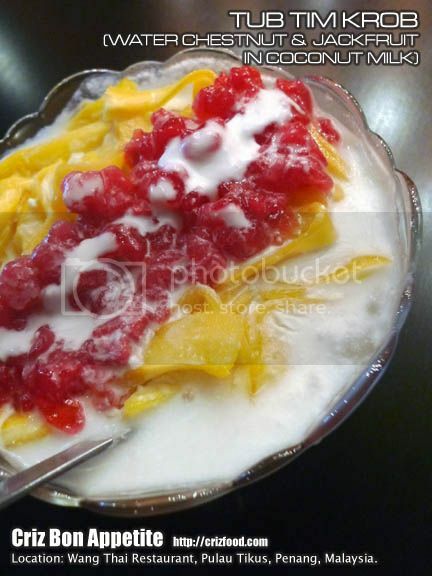 As for dessert, we had the Tub Tim Krob (Red Starched Water Chestnut & Jackfruit in Coconut Milk – RM4.50). I love the taste of the mildly sweetened concoction with generous amount of cubed water chestnuts and sliced jackfruit given. The next dessert was the Khao Neow Mamuang (Mango Sticky Rice – RM9.90). 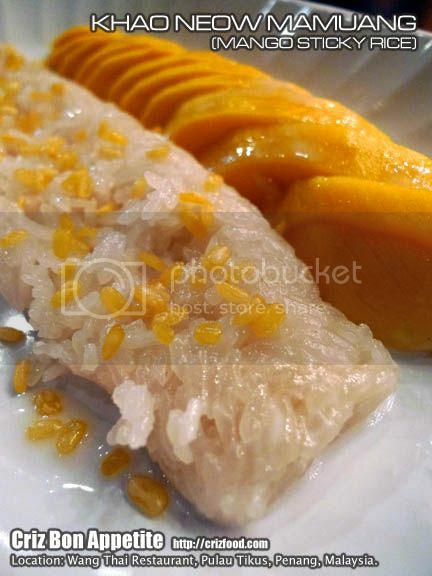 The dessert came with a long roll of steamed glutinous rice, garnished with some deep fried mung beans, served with slightly salted sweetened coconut milk and mango slices. The combination was good, except that I would prefer a thicker coconut milk on my glutinous rice dessert. I had tasted a thicker coconut milk version elsewhere, which had some corn starch added in for a thicker and creamier spread. Overall, the food here is quite nice if you know how to have some mix and match dishes that would not be almost similar in taste. 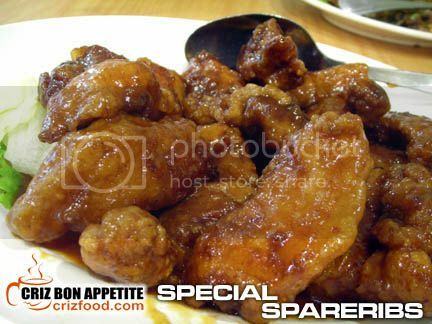 Most of the recommended signature dishes here are towards a spicy, sweet and sour taste. 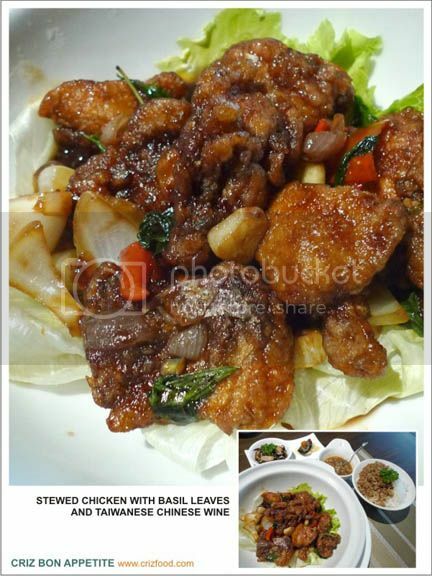 You should ask the person-in-charge to combine some dishes more of a salty based such as the Gai Hor Bai Toey (Pandan Chicken – RM3/pc), Kar Moo Nan Dang (Stewed Pork Trotter – RM27/RM45.90), Gai Phad Kraprow (Stir Fry Chicken with Basil Leaves – RM12.90/RM22.90) or just a simple sty fry mixed vegetables with prawns/roasted pork (Pad Phuk Ruam Mit Goong/Moo Grob – RM12.90/RM19.90). It’s not hard to locate the restaurant as it situated along a row of shop houses at the main road of Jalan Burma in Pulau Tikus, Penang. If you are coming from town towards Pulau Tikus, watch out for Jalan Burma/Jalan Cantonment traffic lights. You can see the restaurant diagonally on your right (Pinang Medical Supplies is at the corner lot). Immediately after the traffic lights, turn right into the service road and find your parking space there. It might be a bit hard to get a parking space at certain peak hours, so another option would be go straight into Lintang Burma for more parking spaces. 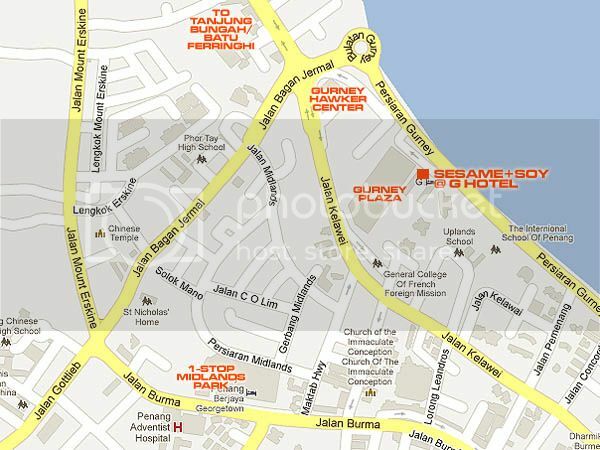 Address: 294 Jalan Burma, 10350 Penang, Malaysia. 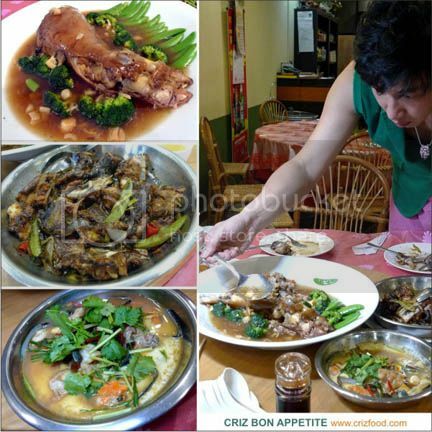 During the recent Penang Food Hunting Trip 2011, organized by Food Digest Magazine, Malaysia’s No. 1 food and lifestyle magazine, Taiwanese Celebrity Chef Chen Hong (陳鴻), together with renowned Chef Park Tae Yeong (from Korea) and Chef Billy Ng Yih Lee (runner-up of 8TV’s Hot Chef Season One) were bought to a little Chinese restaurant down town in the heart of Georgetown, Penang. The restaurant by the name of Chin Bee Tea Restaurant, coincidentally, was also my most recommended restaurant in 2009 as well as in 2010. The chefs were glad that they had the privileges to meet up with the last remaining of the top few Chinese cuisine chefs in Penang, Sifu Malai Chong, 68 years old. 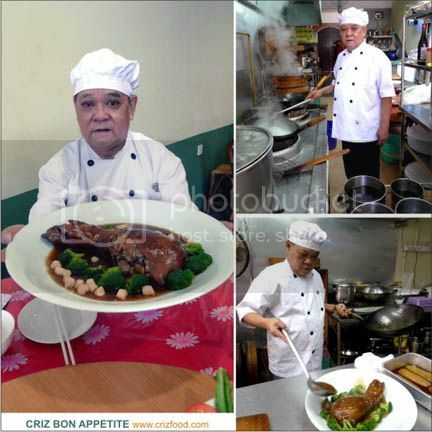 With over 5 decades of cooking experiences locally and internationally, the Sifu managed to capture the chefs’ hearts with his creative culinary skills and dishes. Three signature dishes from the old chef’s own creation were presented namely the Stuffed Pork Trotter with Eight Treasures (八寳豬手 – RM80nett), Dry Fry Grouper Head (生炒石斑魚頭 – RM30nett) and Five Continents Under the Moonlight (月光照五洲 – RM30nett). 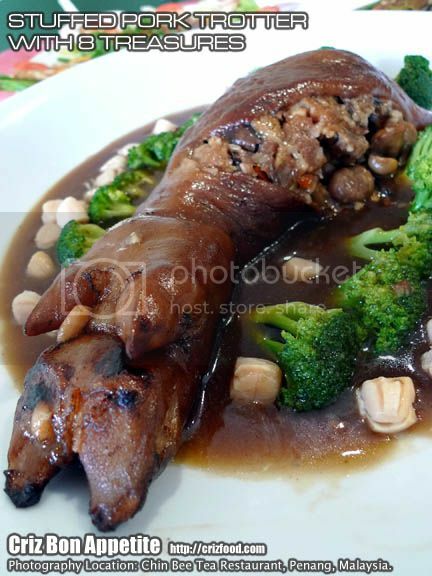 All the chefs were impressed with the “Stuffed Pork Trotter with Eight Treasures” as it was rich in flavors and without the strong pork smell, evidently stated by Chef Chen Hong during his audio interview with the bloggers. He even tried to survey more on the ingredients used in the dish. I’ll brief more on the ingredients and preparations in our recent interview with the Sifu below. The “Dry Fry Grouper Head”, on the other hand, was specially marinated in the chef’s secret sauce and dry fried in the fish’s own juice, WITHOUT ANY DROP OF WATER. It had some vegetables such as carrots, onions, snow peas and the pungent taste from the added chilies. The “Five Continents Under the Moonlight” was actually the chef’s smooth and silky steamed egg with five different types of toppings, namely mussels, prawns, grouper fillets, squids and century eggs. 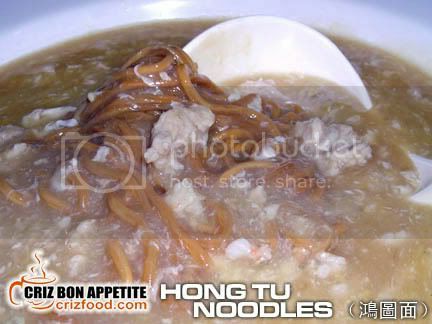 Other than the three main dishes, Chef Chen Hong was also introduced to two of their signature noodle dishes such as the Hong Tu Mien (鴻圖面) which had Ee Foo Noodles (伊麵), in a sharksfin soup like broth with chopped prawns, chicken slices and eggs, served with black vinegar and the Gui Hua Mien (桂花麵) which also had Ee Foo Noodles but stir fried with a generous amount of crab meat, scallops, prawns and egg, garnished with lots of sliced lettuce, served with the chef’s own concocted fragrantly fried chili paste (sambal). In a recent interview with Sifu Malai Chong, we had the Stuffed Pork Trotter with Eight Treasures (八寳豬手 – RM80nett) recreated to check out what made Chef Chen Hong so impressed with this dish. I would say I was as equally impressed as the chef with the rich taste and quality of the ingredients within the stuffed pork trotter. 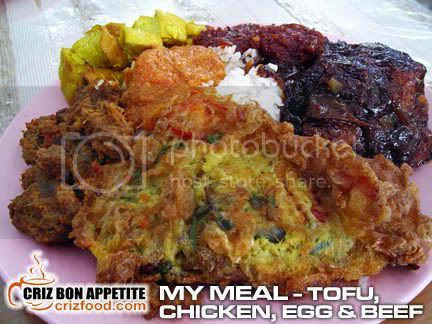 The Sifu had really put in all his time, effort and passion into this dish and at RM80nett, this is super cheap. To get rid of the normal strong pork smell, the pork trotter was soaked and washed many times. After ridding of the excess water, a layer of seasoning was applied to the trotter and then deep fried to perfection. 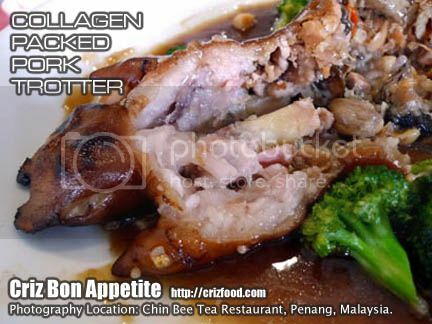 When cool down, the Sifu carefully deboned the trotter, while reserving the meaty parts to be added back into the dish. The stuffing actually consisted of a combination of stir fried meat cubes from the trotter (豬手肉) plus eight other treasures such as scallops (乾貝), sea cucumber (海参), mushrooms (花冬菇), Chinese water chestnuts (馬蹄), Chinese chestnuts (栗子), lotus seeds (蓮子), carrots (紅蘿卜) and glutinous rice (糯米). These stir fried ingredients were then stuffed back into the deboned trotter, sewn up and steamed up to 6 hours. The remaining juice from the steamed trotter together with some corn flour, dashes of Shao Xing wine would then be used to make the gravy with some additional pre-marinated steamed scallops. The taste of the filling was like the Chinese savory dumpling, rich and delicious. You would need to order this dish in advance to avoid disappointment. You can have a look at how many bones there were left on trotter. There was only one left and the rest are just cartilages, full of collagen, a protein that is commonly found in the body of mammals. It’s believed to slow down the aging processes and keep you young although there’s no proven medical research that it would really help. It’s just a trend, especially amongst the ladies who would want to try out anything just to be wrinkle free. Anyway, collagen is harmless as it would just break down into amino acid just like any other protein. 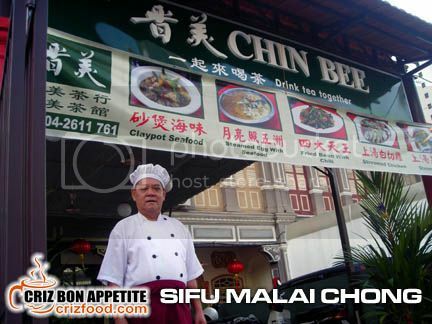 Here’s a short video on the interview with Sifu Malai Chong by our podcaster, Mr. Willy Wah. It’s in Cantonese and is up in Mobile Radio Hong Kong now. The chef also came out with two more of his self created dishes. 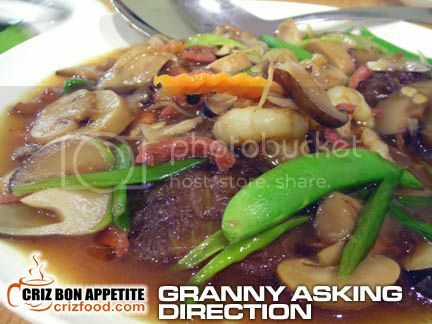 One of them was the funny named Granny Asking Direction (婆婆問路 – RM20nett) which I had introduced last year. It’s a poor man’s way of having an expensive sea cucumber dish. The Sifu steamed the fuzzy melon/squash (毛瓜/mo kua) in thick broth (上湯) and seasoning to make the melon looked just like sea cucumbers and the dish had some seafood, vegetables, mushrooms, scallops and sliced chicken sausages. The whole presentation was rather exclusive. This dish would suit the elderly too as the “sea cucumber” aka melon would not be as tough as the real one. Moreover, the thick gravy matched well with the rest of the ingredients. 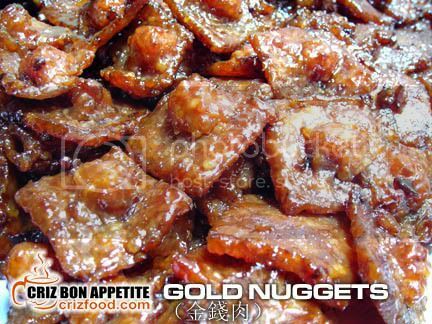 The next dish also had a bombastic name – the Iron Net Golden Dragon (鐵網金龍 – RM3.50nett/pcs, Min order 2 pieces). It’s even cheaper than most of the Thai items I had tried before. As for this dish, there was again the hardship in getting the dish out as it was not as simple as it looked to get that shape. Each piece would be molded into a pear-like shape with a “dragon” aka prawn wrapped with salted duck egg and “gold nugget” (金錢肉) as the ones I normally get from Choo Choo Heng during Chinese New Year. This shaped item would then be rolled into some frying flour, wrapped in the chef’s secret “iron net” and then rolled again into frying flour prior to being deep fried. The secret “iron net” which is actually a pig’s caul fat netting (猪油網), a very thin lacy membrane that surrounds the viscera of a pig, is a traditional Chinese way of containing a loose product prior to deep frying. It shaped the product when the fat melts away, leaving that extra fragrant that would be simply delicious. The end products were sliced into halves and served with some coriander, chopped pickled ginger (調味醋姜片), pickled Rakkyo bulbs (酸甜蕎頭) and Thai chili sauce. After a disastrous meal at Bahtera Santai Seafood & Ikan Bakar, finally there’s a nice and cozy Malay restaurant with some heritage feels down in the heart of George Town. At least I can have a proper venue to enjoy authentic Malay flavors in a more comfortable environment without the disturbance from some pesky insects. 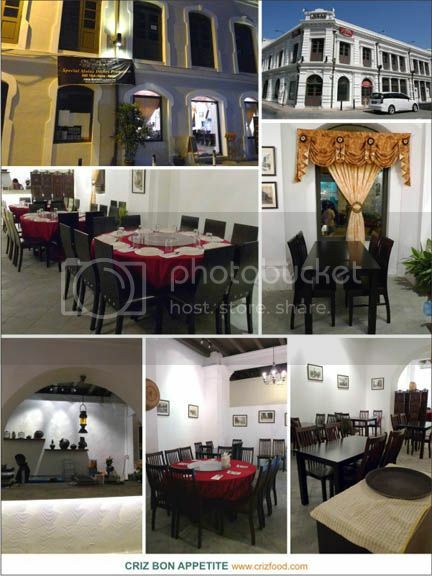 D’Dapor Express is a sophisticated Malay restaurant, located within one of the shop lots in the newly restored 140 years old pre-war building named Logan Building, along the banking district of Lebuh Pantai. Today, the building has been renamed as Logan Heritage and housed an arcade of food & beverage outlets and other retail outlets. 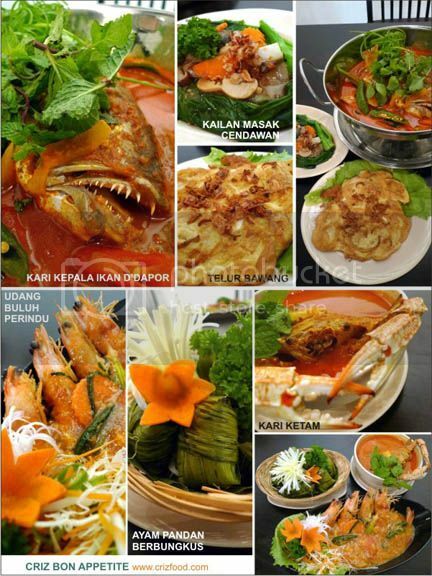 Presently, D’Dapor Express is promoting its Set Lunch and Set Dinner with Kari Kepala Ikan D’Dapor (D’Dapor Curry Fish Head), Taugeh Tumis Ikan Masin Salted Fish Bean Sprouts), Telur Bawang (Onion Omelette), Ulam-ulaman (Raw Herbs with Sambal) and steamed rice at RM39.90++ (for 2-3 pax) or Kari Kepala Ikan D’Dapor (D’Dapor Curry Fish Head), Ayam Kelasan Malindo (Indonesian Fried Chicken), Taugeh Tumis Ikan Masin (Salted Fish Bean Sprouts), Telur Bawang (Onion Omelette), Ulam-ulaman (Raw Herbs with Sambal) and steamed rice at RM65.90++ (for 4-6 pax). One of the new sets (RM39.90++ per set) we had tried out inclusive the Kari Kepala Ikan D’Dapor (D’Dapor Curry Fish Head – normal price at RM38++), an all-time favorite amongst the locals. A freshly chosen fish head was carefully prepared with curry spices, chilies, onions, tamarind juice with some dashes of coconut milk, served with sliced eggplants, ladies fingers and tomatoes, with some touches of spring onions and fresh mint leaves as garnishes. 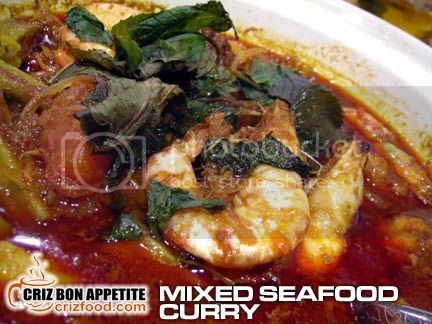 This dish was quite similar to the Nyonya style fish curry, without the strong traces of sweet basil (daun kesum) but with the usage of coconut milk. This was quite a reasonably good dish, especially when the dish was served piping hot. Well, the Telur Bawang (Onion Omelette – normal price at RM6.50++) and Kailan Masak Cendawan (Stir Fry Kailan with Mushrooms – normal price at RM8.80++/RM19.80++) were two common dishes you would get anywhere. The next new set inclusive the Udang Buluh Perindu (Spicy Prawns served in bamboo which in this case it came on a plate – normal price at RM18++/RM27++). The dish came with four juicy prawns cooked in sweet and spicy gravy. The gravy tasted like the Oriental style sweet and sour crab minus the presence of vinegar. There was a strong hint of chili sauce being used in the dish. The Ayam Pandan Berbungkus (Screw Pine Leaves Wrapped Chicken – normal price at RM12.80++/RM22.80++) had some Thai influence with the usage of turmeric powder, ginger, onions and garlic as marinates to the chicken meat chunks, prior to being wrapped in pandan leaves and deep fried. Unfortunately, the marinate time was not enough to let the flavors seeped into the meat. Moreover, the size was rather small for reasonable bites. 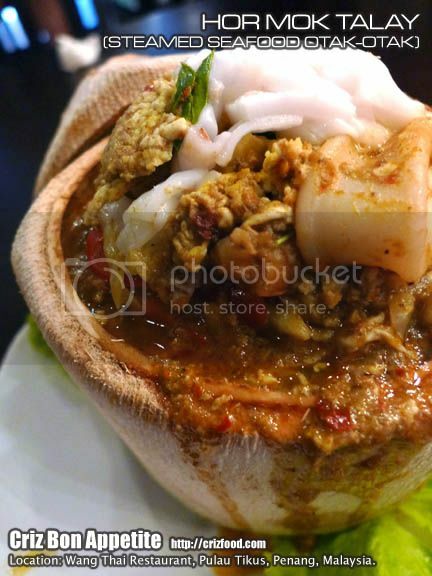 The Kari Ketam (Flower Crab Curry – normal price at RM25++) was a new addon in the menu. The cooking style again was so much like the Nyonya Masak Lemak Nenas, a spicy and pineapple fruity sweetness curry where seafood such as either some prawns, fish or squids were used as the main ingredient. This dish was rather tasty, considering that the sweetness from the crab has gone right into the gravy. Instead of going for the set meals, you can also try out some of the items in their ala carte menu. The Kari Ayam Kampung Melayu (Traditional Malay Chicken Curry – RM12.80++/RM22.80++) was quite tasty. The dish has thick gravy somewhat like the Nyonya Curry Kapitan Chicken minus the strong taste of Kaffir lime leaves. Another dish that would be quite a good appetizer would be the Kerabu Mempelam Tiga Serantai (Mango Salad Trio – RM8.80++/16.50++). The dish used finely sliced raw mango, onions, lemon grass and chilies with a light squeeze of lime juice to pep up the taste. It has a generous amount of crispy satay ikan bilis (deep fried spicy anchovies) and bunga kantan (ginger flower bulb) as garnishes. To get there, just drive all the way along Lebuh Light until you see a roundabout where you would see an stainless steel betel nut structure being displayed there (or Queen Victoria Memorial Clock Tower) and turn 3’o clock into Lebuh Pantai. Just a few meters away, you would see the Standard Chartered Bank on your right. 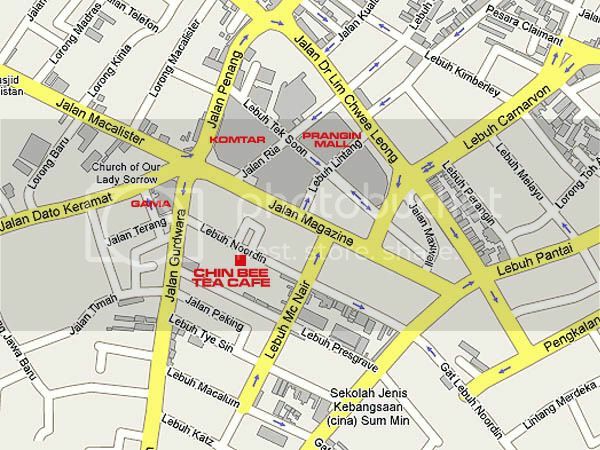 Turn right into Lebuh Union and you would see the restaurant on your left, right before Maybank Union Street Branch. Unfortunately, they do not have a prominent signage on their entrance yet but you won’t miss it. Parking spaces would be quite ample during off-peak period. If not, you can park in the multi-storey car park after Maybank or the Sri Weld Food Court car park (slightly after Hongkong Bank) along Lebuh Pantai during lunch hours. 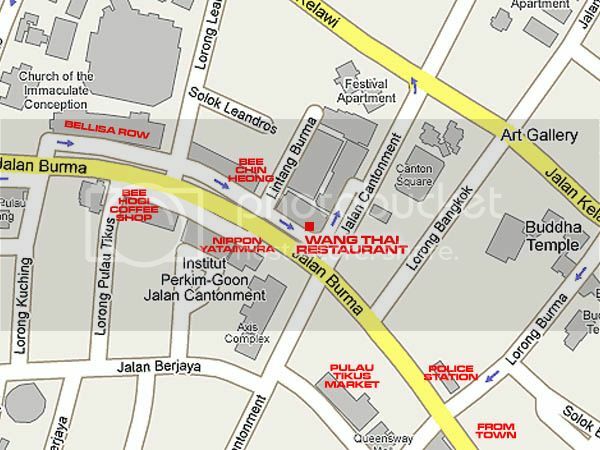 Address: 7 Lebuh Union, 10200 Penang, Malaysia. I had written earlier on Nasi Kandar Beratur in the heart of Georgetown, Penang, which got many people grumbling impatiently just to wait for their turn to get their plate of curry rice. Alternatively, out of the many Nasi Kandar shops scattered all over Penang island, I found one that has the same quality, if not better, that would cut down on your waiting time. 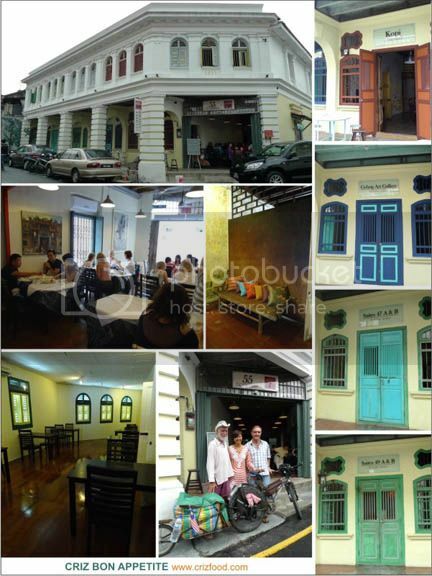 It’s also located within the heart of Georgetown, Penang, with ample sitting places. 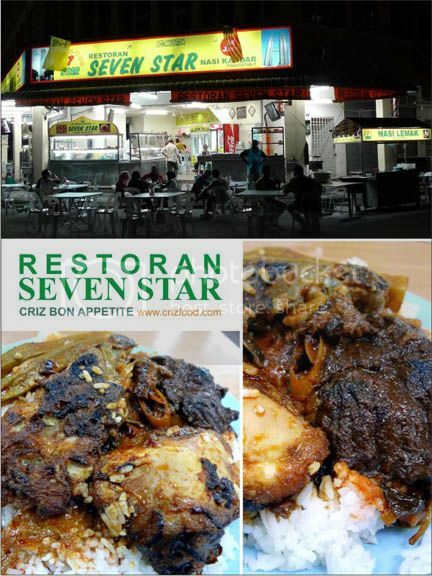 It’s called Restoran Seven Star with only another branch in Changlun, Kedah. 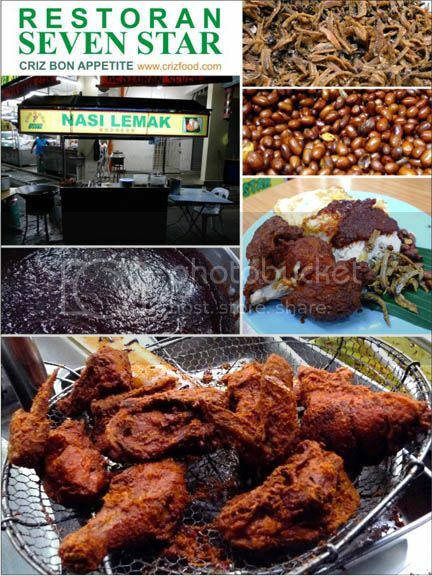 Just to compare the price of the food served here with Nasi Kandar Beratur (NKB), I ordered the same items. I had a plate of rice (RM1 – a bit more than NKB) with onion omelette (RM1), a chicken thigh (RM3 – NKB cheaper with a full drumstick at only RM4.50), a piece of beef (RM1.50) and 2 steamed lady fingers (60sen) which cost RM7.10 a plate. Although the price here can be considered a bit higher than NKB in term of the chicken pieces, the beef slices served here were indeed bigger, thicker and awesomely more flavorful. On top of that, there were more options here (flower crabs, fish egg, squid eggs, different style of mutton and fish curries. I personally felt that the combination of different curries on the rice here was indeed more heavenly than NKB. You should not miss out their Indian Onion Fried Chicken (RM3 per piece) as it’s extremely tasty with the rich flavors from the deep fried onions and spices. 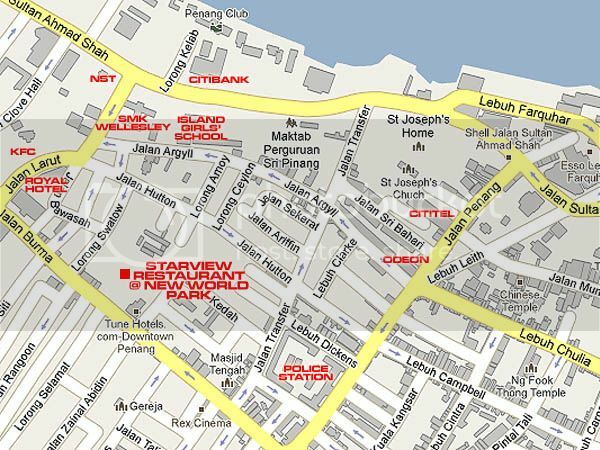 Finding the restaurant is rather easy as it is situated just at the corner of some new shop houses along Gat Lebuh Macallum, leading to the wholesale dry market and Harbour Trade Centre. If you are coming from the ferry terminal along Pengkalan Weld (Weld Quay) towards Jelutong Expressway, just take note of three yellow colored medium cost apartments on your left (Sri Saujana 42A, 42B & 42C). Turn left into Gat Lebuh Macallum just before the traffic lights (Gat Lebuh Macallum/Pengkalan Weld). You can see the corner restaurant at the left side service road. WIFI would be available here and this is a nice place to hang out with friends, provided the weather is fine. 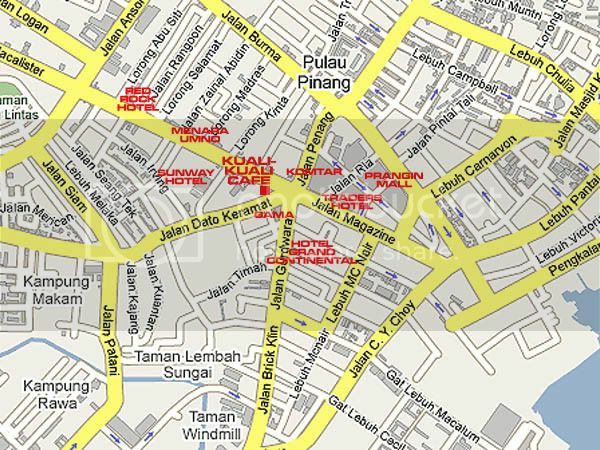 Address: 40 Gat Lebuh Macallum, 10300 Penang, Malaysia. Address: 4-A-Aked MDKP, Pekan Baru Changlun, 06100 Changlun, Kedah, Malaysia. My family members (7 adults & 2 child) recently had a dinner at the Starview Restaurant, located right within the New World Park premises. 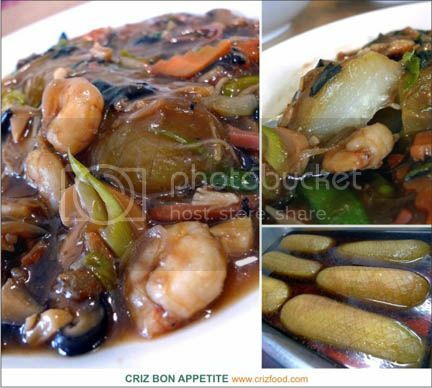 This restaurant has been in establishment for many years and specialized in Chinese cuisine. One of the more famous dishes would be their delicious fish steamboat that had endless streams of loyal patrons. 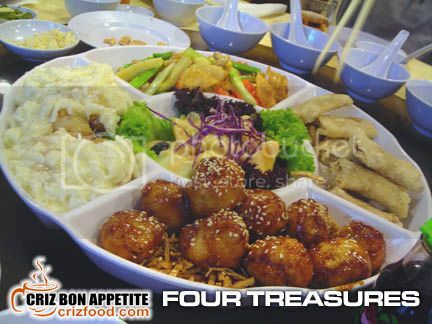 The first dish that was served was the Four Treasures (四寳 – RM80). In fact, it had a fifth dish on the palate which was some mixed fruits and vegetables salad. Refreshing! The first dish was Fried Sweet & Spicy Fish Balls. The handmade fish balls was nicely stirred in some fragrant secret sauce and presented on a bed of deep fried crabstick strips with some toasted sesame seeds sprinkled on. Delicious! The next dish was their popular Stuffed Aubergine in Egg White. I was so much in love with the stuffed aubergine as the filling of minced prawns and pork were just right and the egg white gravy flowed smoothly into my mouth as if consuming some silky smooth tofu. 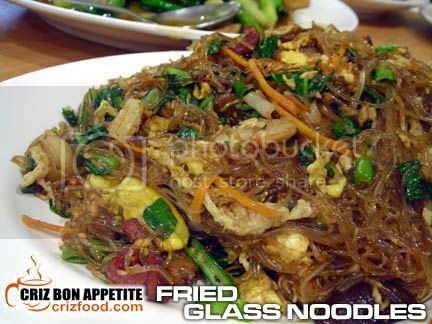 These were served on a bed of deep fried glass noodles. Wonderful! 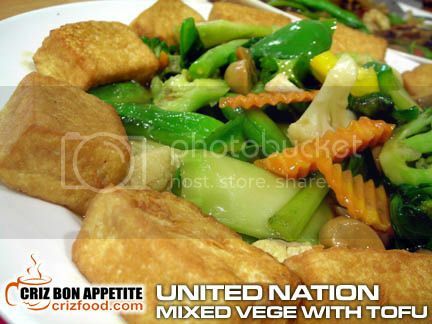 The third dish was Stir Fry Mixed Vegetables with Fish Bladder. I loved this dish especially when it had some much of crunchy asparagus in it and the fried fish bladder indeed added the extra flavor. Slurps! 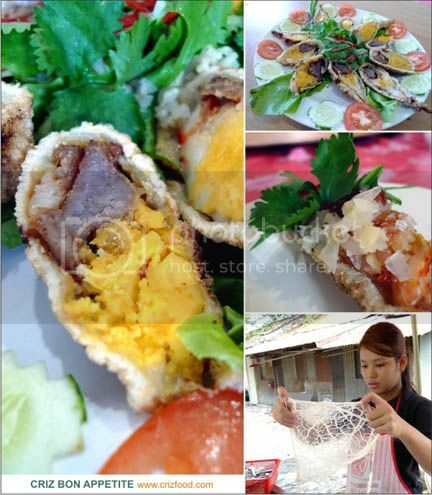 The last of the combination consisted of Deep Fried Vietnamese Rolls. The mixed vegetables rolls had coats of batter. I find these to be a bit common on the palate. Scallops with Seafood & Sharks Fin Soup (乾貝海味翅 – RM100) was served next. Whichever time I dine in this restaurant, the taste of the soup served here has never fail my taste bud. The chef sure did a great job in preparing their tasty stock (上湯). 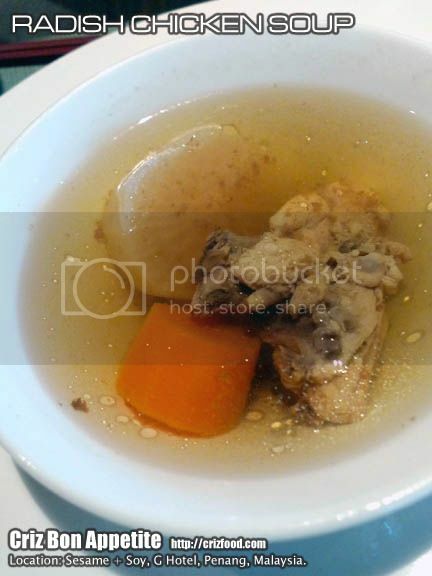 If you had notice in the photo, I would say that there were more ingredients than the broth. Haha! Other than the over generously serving of crab meat, there were traces of diced prawns, sliced fish bladder, fish lips, sharks fin and deep fried scallops as garnishing. Simply delicious! 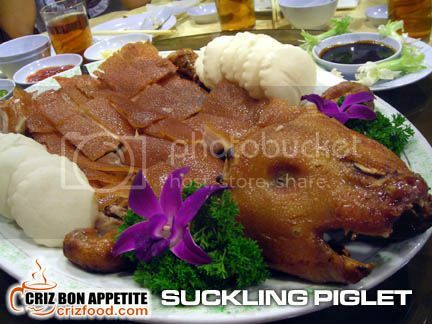 The Suckling Piglet (片皮乳豬 – RM138) served next was simply irresistible! What’s the secret? Go there early to get served with the choice piglet that just came out from the roaster. 😛 The skin of the roasted piglet was real crispy. So was the tender and juicy meat with the right amount of baby fat. This dish came with some flower-shaped mantou (steam buns) for stuffing in the roasted pork slices. 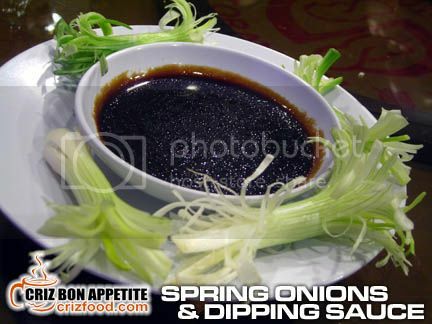 The actual way of eating this dish would be by spreading some of the specially prepared sweet sauce onto the meat, together with a stalk of spring onions, wrapped in the mantou. One bite on this combination and you would see yourself yearning for more. Perfect! With all the meat from the last dish, we needed something not so meaty fat. 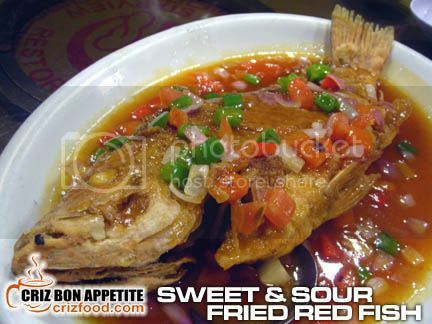 We had Sweet & Sour Fried Red Fish (甜酸紅獅 – RM45). The red fish which looked quite identical to the red snapper family was around 1kg and it was real fat. The chef did a great job in frying the fish with a mild touch of flour with the outer layer having the crisp while the inner flesh remained its juices. The gravy poured onto the fish was just right. It had the right sourness from the mildly used tomato ketchup and sweetness from the fresh chopped tomatoes, onions and capsicums. Beautiful! When I thought that would be the last seafood dish we would have for the night, we were served with the Salted Egg Yolk Prawn Balls (金皇蝦球 – RM50). This was just a simple recipe with some smashed salted egg yolk, combined with some pepper, flour and deep fried until golden brown but the chef had added in some sliced bird’s eye chilies and curry leaves to make the dish more fragrant. These were served on a bed of sliced iceberg lettuce. Amazingly tasty! 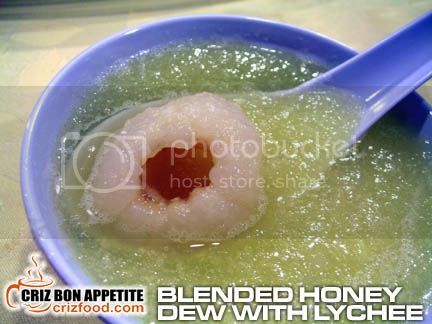 Finally, we had the last dish for the night which was Chilled Blended Honey Dew Sago with Lychee (蜜汁西米荔枝- RM25). We were lucky that the honey dew used that night was ripe enough to produce the natural sweetness for this dessert. I like this combination even without the added canned lychee. Overall, the food here would be a bit pricey but real delicious if you know how to order. I had heard many good and bad reviews on this restaurant but I have yet to face any problems. Sometimes, I would say it’s the combination of dishes one would order due to their own preferences but I always left the ordering to my favorite supervisor as she would know better. Do seek Ms. S. W. Ng to recommend your dishes as she had never let me down ever. It’s real easy to locate the restaurant as it’s just within the New World Park premises. 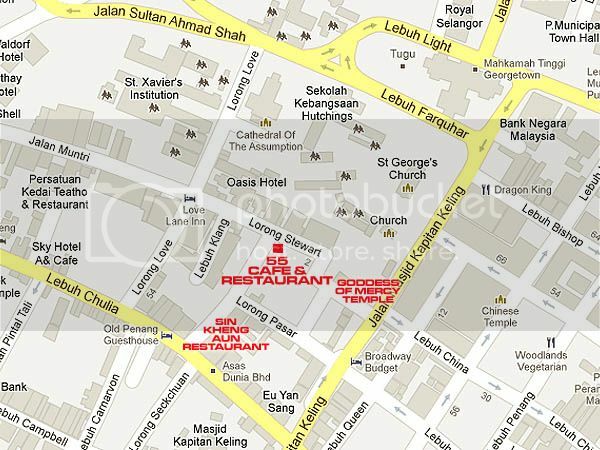 The best way and the nearest way to reach the restaurant would be by the Jalan Burma entrance. Immediately after you had passed the Tune Hotel Downtown Penang on your right, slow down and keep a watch out for the entrance a shop away. Drive in and you would see the signboard not far away on your left. Find a parking space nearby and take note that you can pay for the parking ticket through the many automated ticket machine located strategically within the premises. 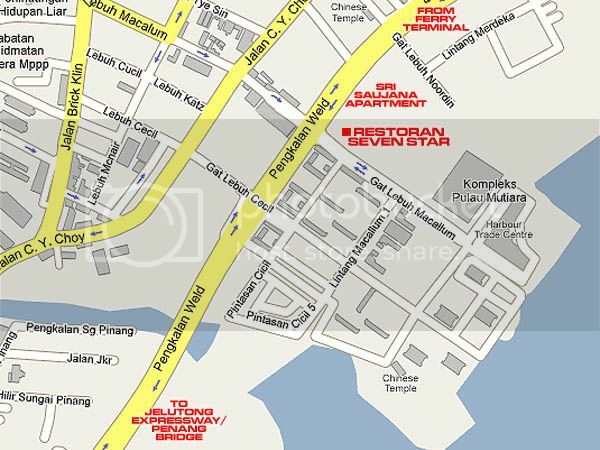 Name: STARVIEW RESTORAN SDN. BHD. 102-B-1 to 102-B-4 New World Park, Jalan Burma, 10050 Penang, West Malaysia. Note: This restaurant has changed management in 2010. The original owner was said to have shifted to KL. Her where about is unclear. “Simply Irresistible! Aromatic! Colorful! Fresh! 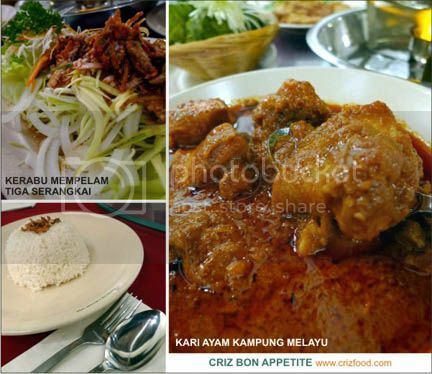 Delicious!” These were the words that shouted out from my mind when I first stepped into this barely 5 months’ old authentic Malay cuisine restaurant right in the middle of the hustle and bustle of Georgetown, Penang. 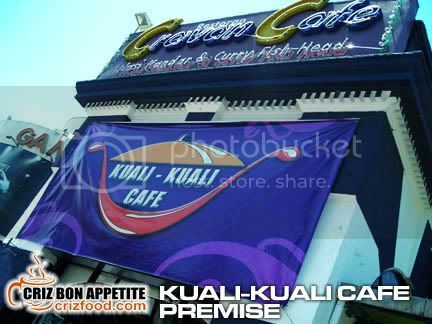 Kuali-kuali Café, as the restaurant was named, took over the former Craven Café premise located at the junction of Jalan Dato’ Kramat and Jalan Macalister and had since grown to be a favorite eating place for Malay cuisine lovers from all parts of the island as well as tourists. I even saw some factory workers in uniforms from the Bayan Lepas FTZ area patronizing them. A brainchild of a former St. George’s High School girl, Cik Sharifah Haslina, together with her husband, Encik Mohd Sophian, catered to the needs of its customer from breakfast until supper. 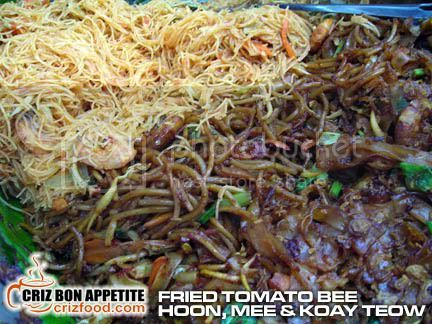 As for breakfast, they would prepare some simple dishes such as Nasi Lemak (Steam Coconut Milk Rice) served with fried anchovies, eggs, sliced vegetables and a few types of curries or you can also try out their ingredients filled noodles such as Bee Hoon (rice vermicelli), Mee (yellow noodles) and Koay Teow (rice cake strips). The breakfast dishes may look simple but the taste was great. What impressed me more was their spreads for their lunch and dinner, served with plain hot rice or occasionally with tomato rice. Could you imagine having around 60 dishes served in cute looking mini woks and rattan trays under that rustic village style attap roof buffet line? 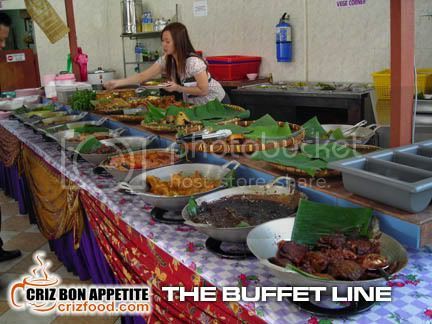 This would surely be a great experience for many as you would only get this type of buffet spread at the hotels. Moreover, most of the dishes were not as spicy hot as their fiery looking colors and they do change a small percentage of their dishes daily. As there were just too many dishes to share you here, I would just brief you on some of the dishes such as their appetizing ulam (Malay salad), seafood, poultry and soup. Let’s start with the salad part. There were many varieties of fresh vegetables and wild herbs served with two types of dressing. One was the Sambal Belacan which has pounded red chillies, chilli paddy, lime juice and some toasted shrimp paste powder. The other was another diluted dressing that would go well with grilled fish. The dressing has some cut red chillies, chili paddy, big onions and tomatoes mixed with some lime juice. Both dressing complimented the vegetables as well as the dishes real well. Do you know that before I went into the restaurant, there was this man outside preparing some grilled fish? The scent coming from the smoke got me even more prepared to jump right into the many varieties of fresh fish dishes they have in there. From the look of the tender yet juicy grilled stingray pieces, you can be assured of its freshness. Even the stuffed hardtail mackerels (ikan cencaru) and chubb mackerels (ikan kembong) had those crystal clear eyes. I can say that they sure know how to prepare their seafood dishes well and with different combination of spices and ingredients. I was surprise to see many seafood dishes that I had not taken for a long time such as the Cockles Salad and Salted Fish Curry. On top of that, the taste of each individual fish curry had its own unique flavors. There were just too many to taste out at one visit. Maybe a slide of the seafood dishes would prove me right. The poultry section was also impressing. They have so many options from a simple Beansprouts with Beef Stomach Salad, Indonesian Dry Beef Curry (Rendang Minang) to their house specialty such as the Red Curry Chicken (Ayam Masak Merah) and Village Style Fried Chicken. The delicious Village Fried Chicken was crispy, a bit like a spicier KFC Original Chicken. If you feel that there would be too much of seafood and poultry dishes in your meal, you could always check out their little vegetarian corner. 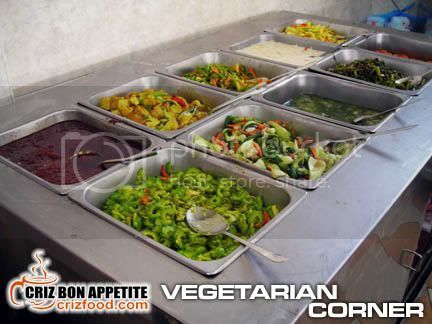 There would be around 10 dishes such as tofu, mixed vegetables, and many assorted vegetables cooked in different styles to meet your desire. Do also watch out for their popular demanded Beef Bone Soup (Sup Tulang Lembu). 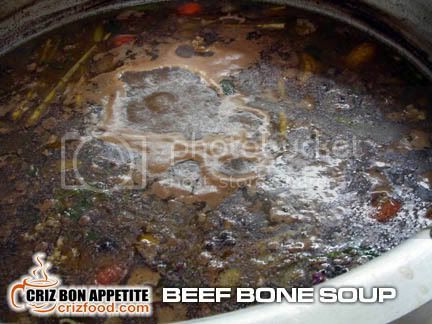 The aromatic smell of the piping hot soup and the tender meat on the bone is a sure must have dish if you love thick and flavorful soups. Each bowl would cost between RM4.50 to RM6, depending on the amount of meaty bones you have scooped. Well, it took me quite some time to study all the dishes in the restaurant but it’s worth the effort to know more of these wonderful authentic Malay cuisines. I ended up with a plate filled with the different types of gravy to try out their cooking style. Moreover, I had a piece of Chicken Thigh cooked with Sweet Dark Sauce, some Turmeric Fried Tofu cubes, Indonesian Dry Beef Curry and a piece of Onion Omelette – all for only RM5. It’s cheap right? You should try to make a visit there and I can assure that you would not regret the experience. Note: If you are real adventurous to try out all the gravy – Do not put too much as my plate of rice ended up with too much oil. But then, I did finish to the last bit as the food was simply too delicious. Another thing to take note would be the visiting hours. The best time would be 7.30am for breakfast, 11.30am onwards for lunch as all the food would be out hot and fresh. They do not cook more dishes for dinner. The dishes would be whatever left during lunch but you can always order other items such as fried rice, noodles soup, etc. Although the restaurant was located at a heavy traffic area with quite limited parking areas, you could see it filled up with customers any period of the day. 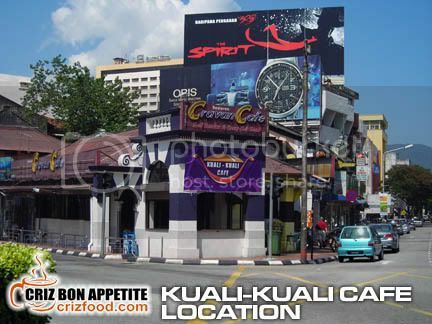 It would not be too hard to spot the place as the restaurant would be located just at the junction of Jalan Dato’ Kramat and Jalan Macalister. Prominent landmarks to watch out would be the GAMA Supermarket and KOMTAR. 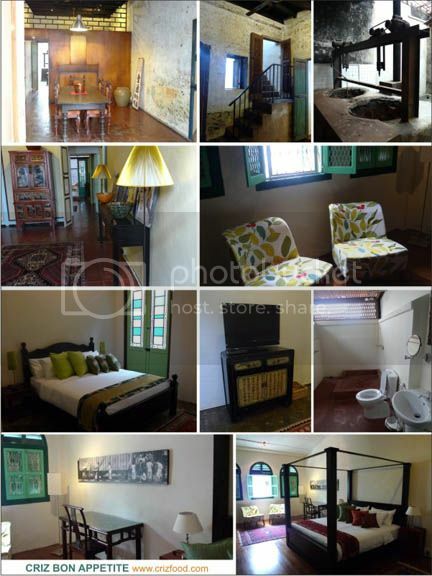 Address: 2 Jalan Dato’ Kramat, 10150 Penang, Malaysia.